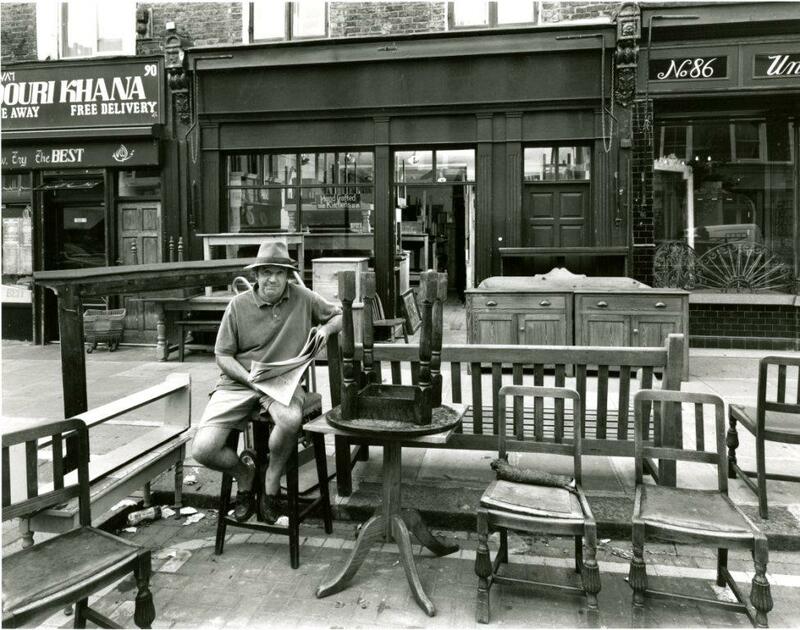 The pictures in the second part of this post on shops in Golborne Road were all taken by Brian Rybolt who as well as being a professional photographer also taught a photography course at the Kensington Institute in Wornington Road. 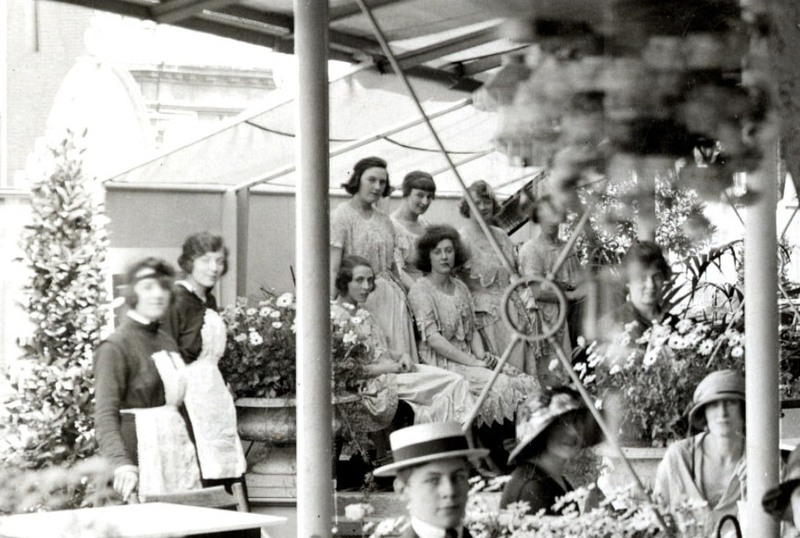 This series of pictures is in the paper archive of Historytalk, the North Kensington Community Archive which was deposited at the Library in 2006. I had seen them before but only recently looked at them in detail. Like a good blogger I knew I wanted to use them here. 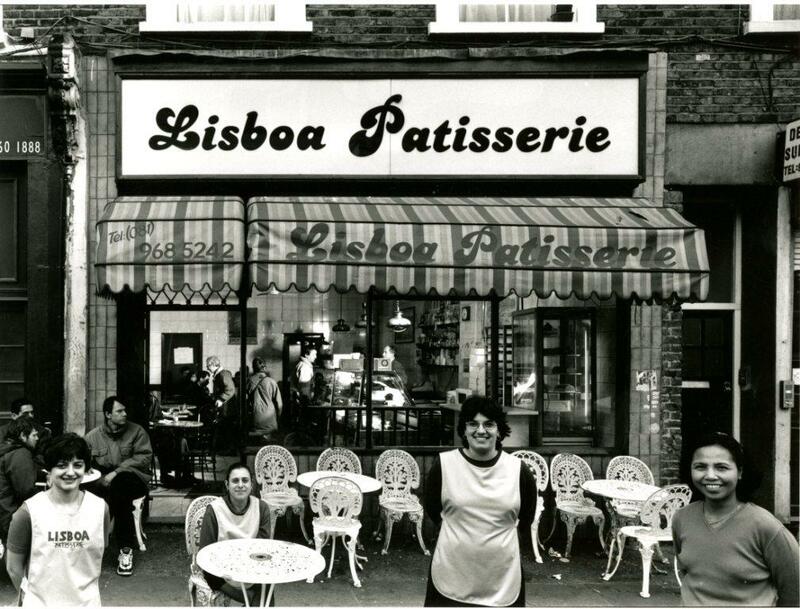 These pictures were all taken in 1997-1998 and were used for an exhibition, “Golborne Shops and portraits”. 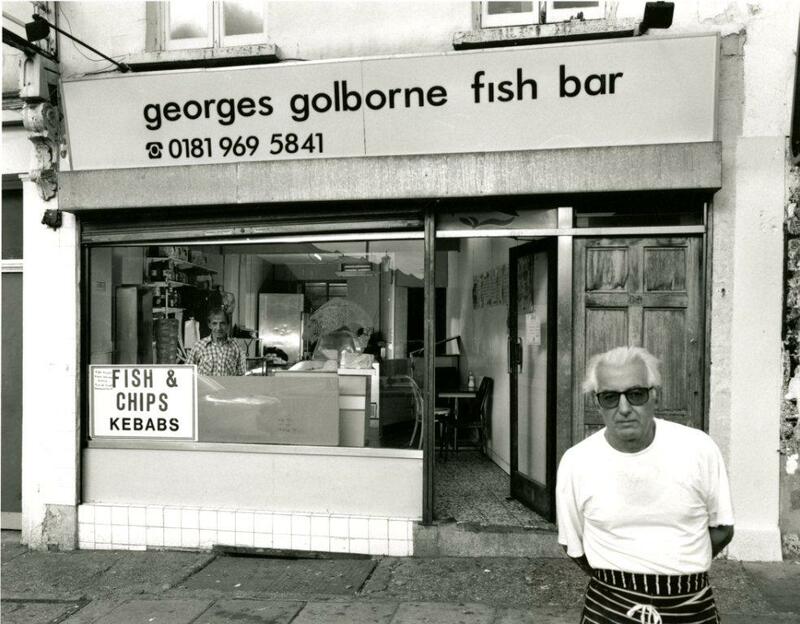 They show how Golborne Road was evolving into what it is today. 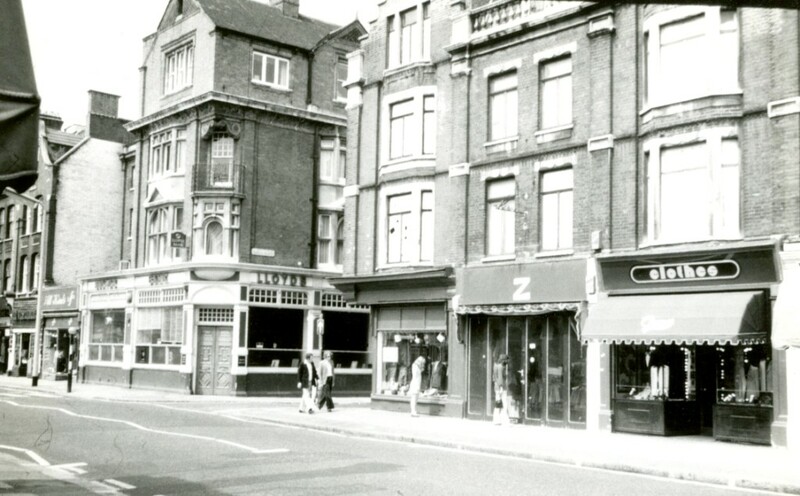 Number 40, still a fish and chip shop as it was in 1969. 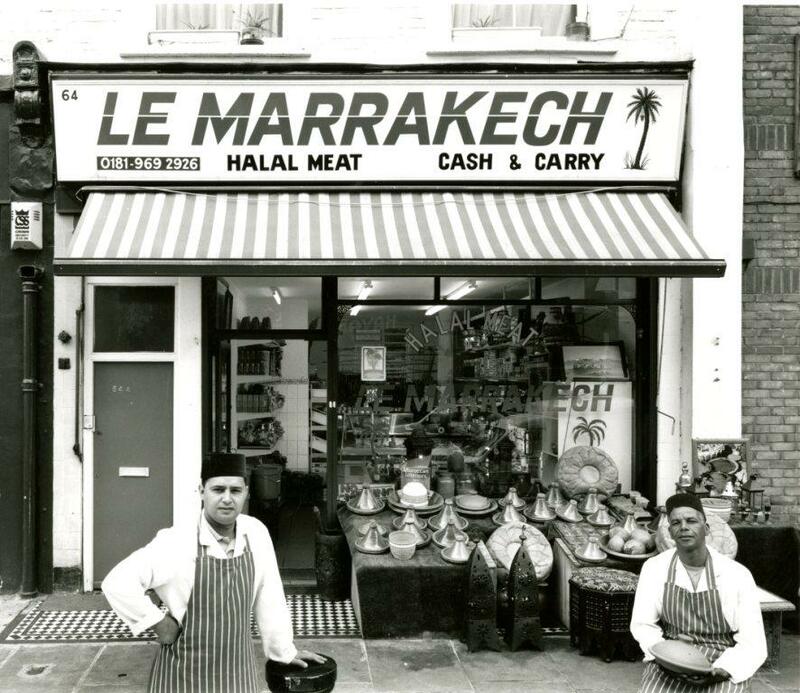 One or two of the shops are in the same line of business, some of them using the same name, run by the same family. Number 53. 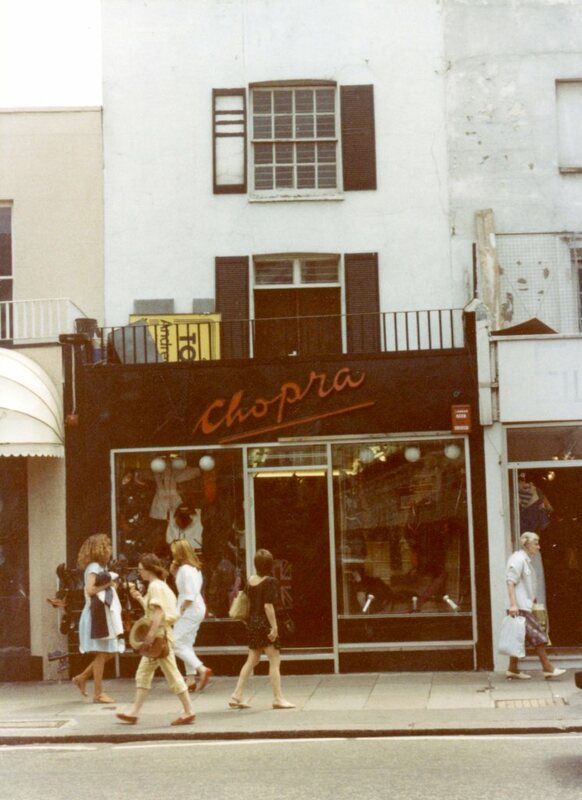 Note that there is a 53A, and above the shopfront, one of my favourite features in a photograph – a person at an upstairs window. See a couple of other examples here (picture four) and here (pictures eight and nine). 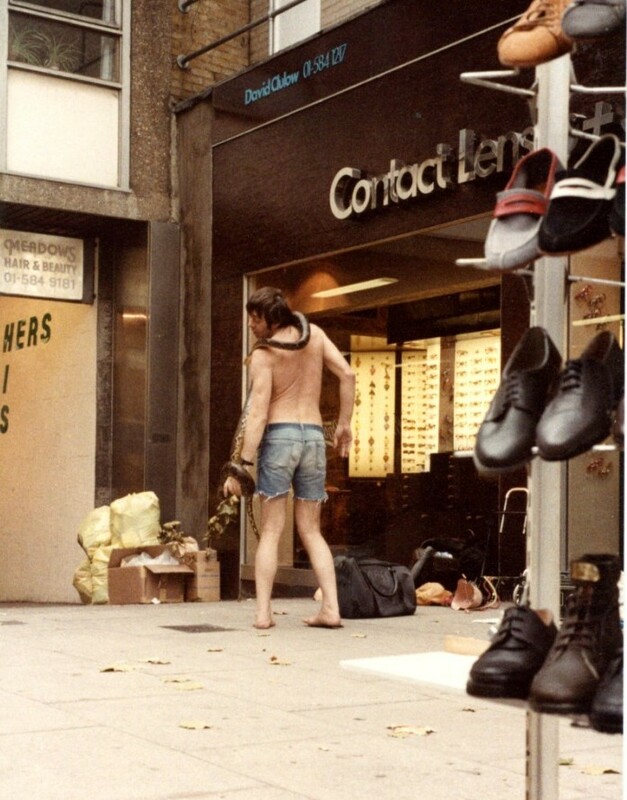 Some shops of course are quite different from 1969. One of my colleagues remembers “the kimono shop” very well. 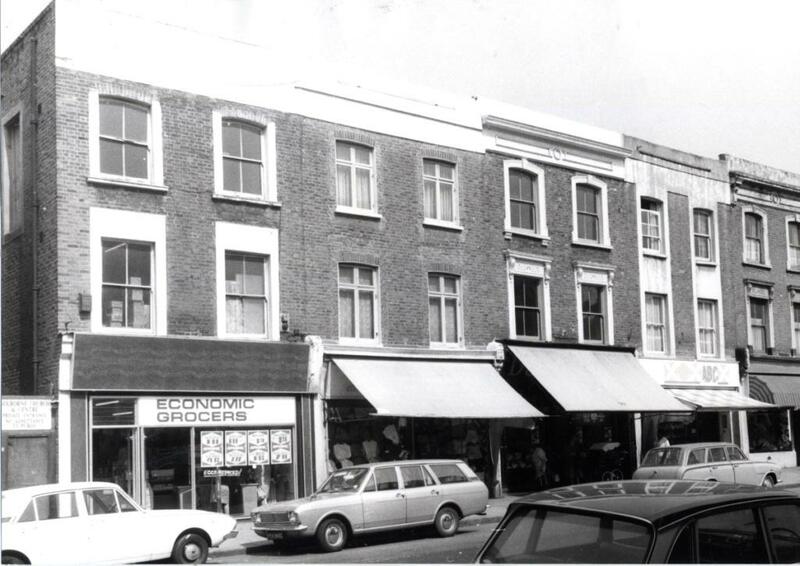 By the late 1990s there were more “general” shops. “Les Couilles du Chien.” What could that mean? I promised you fruit, veg and meat last week, and here is another survivor. 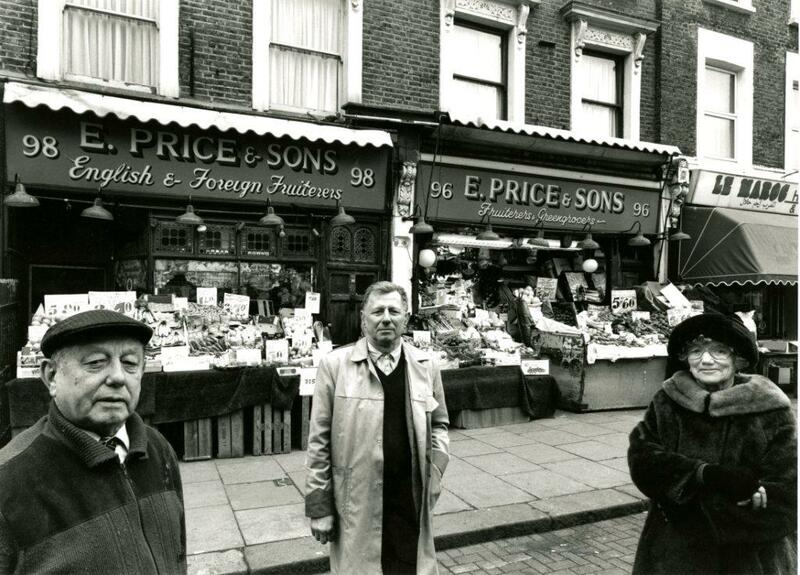 Fruiterers (a good old fashioned term), E Price and Sons. 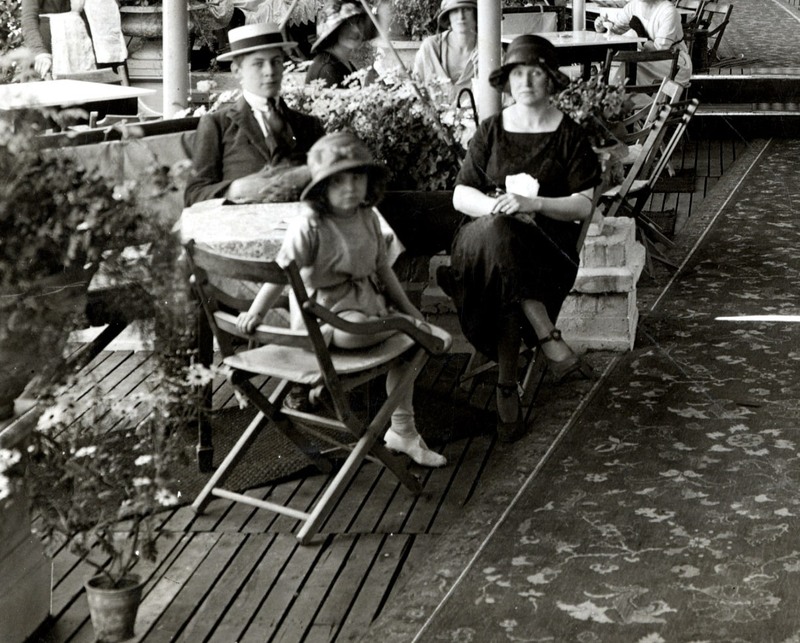 the three people pictured outside were members of the Price family. The business continues to this day. Other food staples included meat. 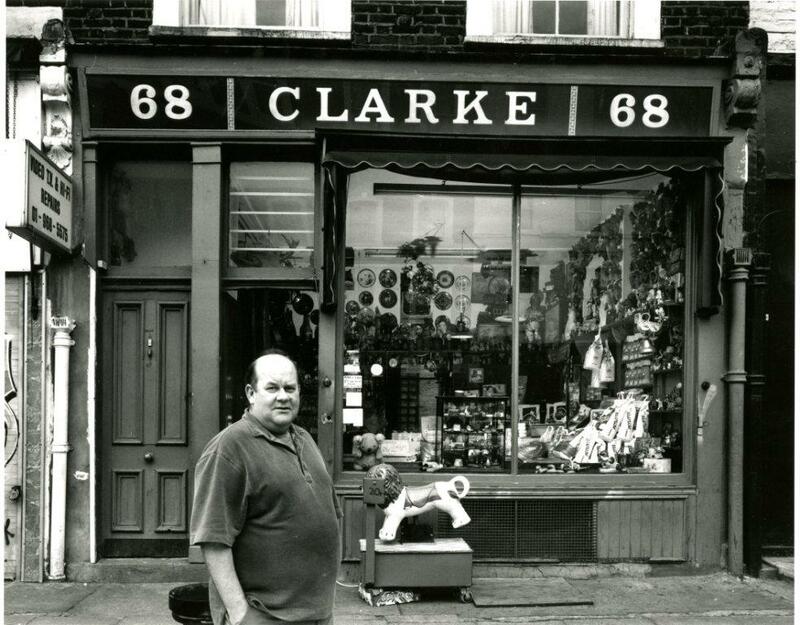 Clarke, described as “corn dealers” in Kelly’s in 1969. 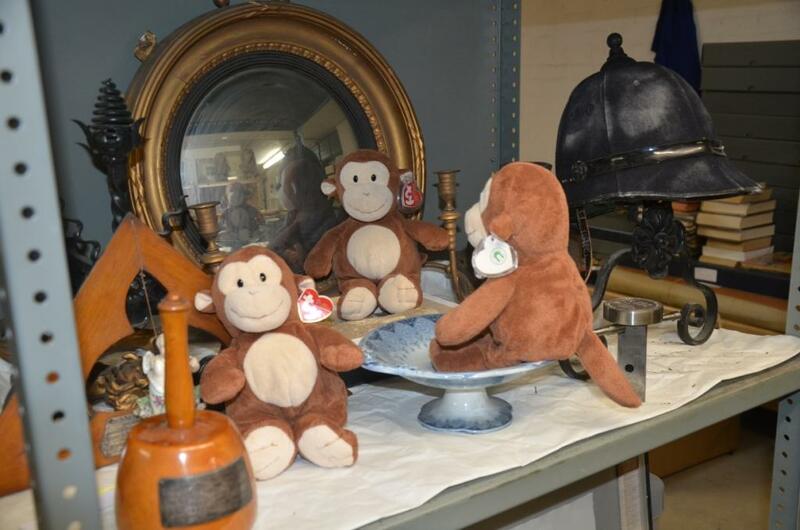 I’ve zoomed in on this picture and you can see some very interesting objects on sale here but I wouldn’t want to commit to a general description. 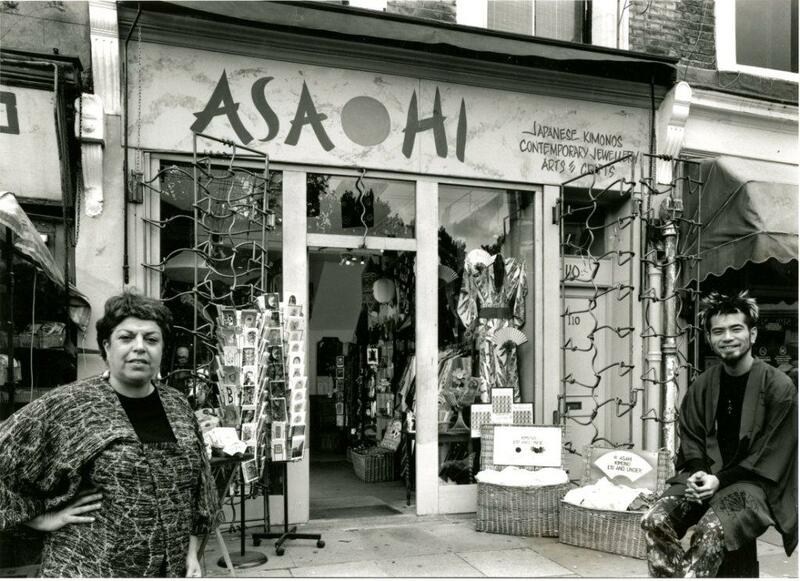 I’m sure one of you knows, so please leave a comment or memory, on this shop or any of the others. 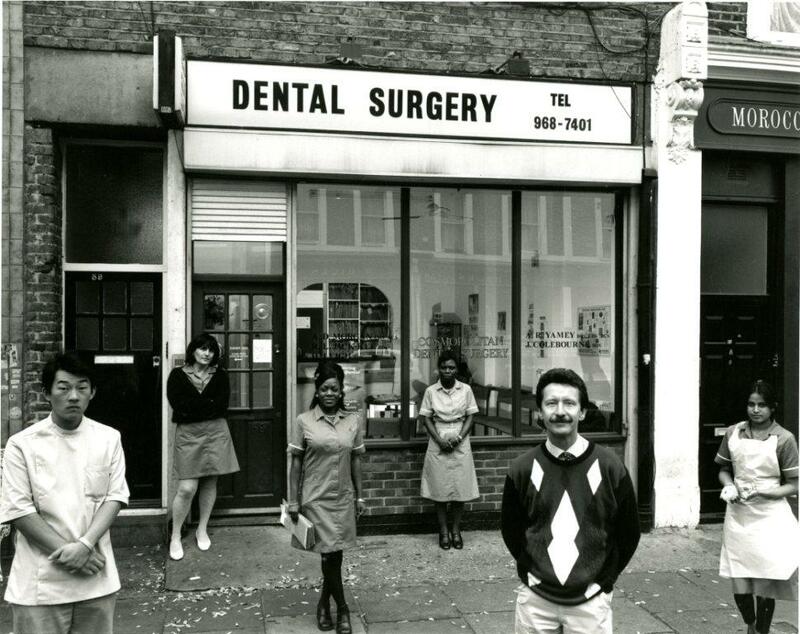 We’re ending as in last week’s post on dentistry. 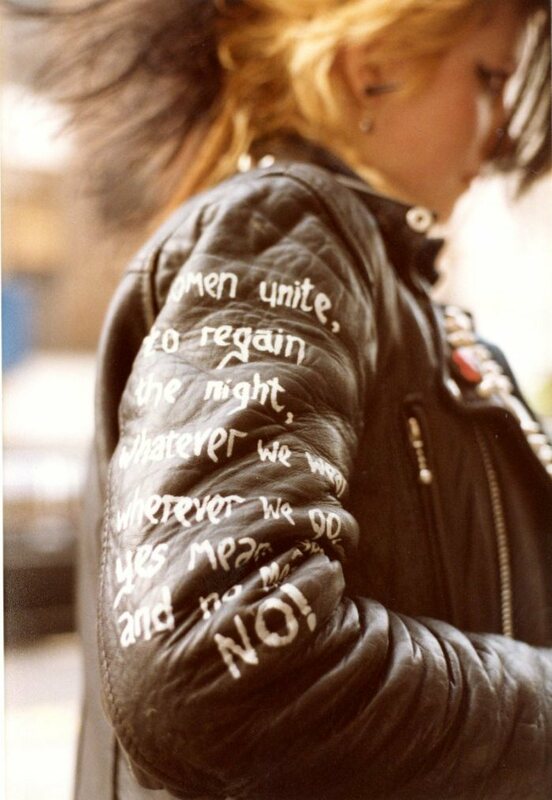 My thanks to the board of the now closed Historytalk for depositing their collection with the Library, but mainly to Brian Rybolt himself who now lives in Hastings I believe. Although his photographs have been deposited with us, copyright remains with him so these images should not be reproduced without his permission. Thanks also to Maggie and Sue for background information. 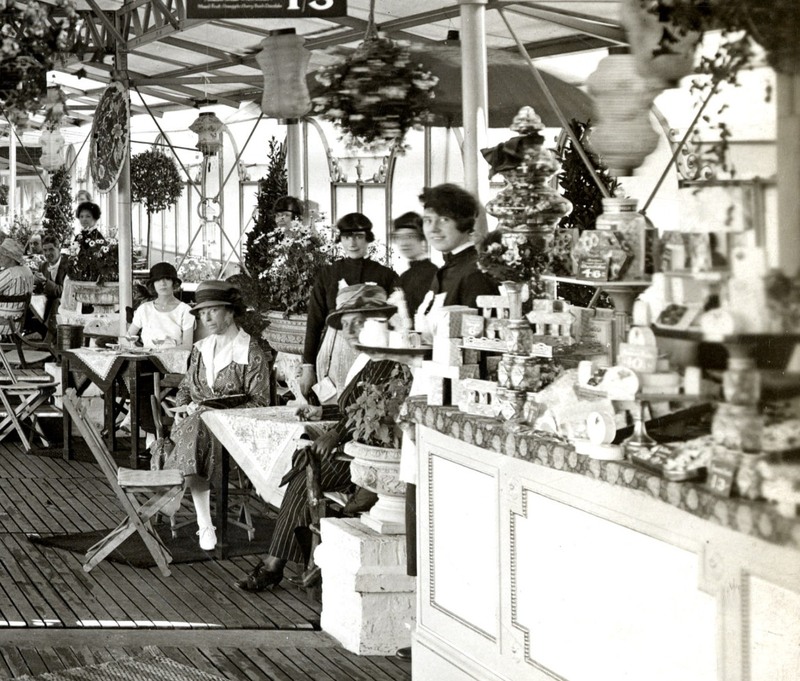 There are 36 pictures altogether, a genuinely valuable historical resource. We’ve featured a number of different photographers in the last year or so, professionals and gifted amateurs but what they all have in common is that they printed their pictures. With digital photography it is possible to take many more pictures than was ever possible, but too many of them languish on hard drives. Print out your best pictures! Libraries like ours are always interested. Because I liked the dog. And because of the dog, a child. 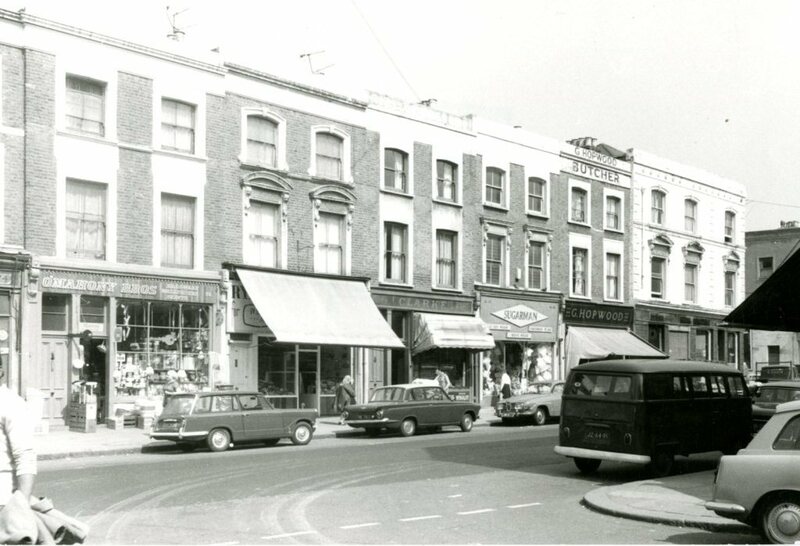 Take a walk down the modern Golborne Road, either in the flesh or as I did a few moments ago, on Google Street View, and you see a bright, pleasant road with plenty of food shops, cafes and specialty retailers, with stalls selling flowers and street food. The pavements are wide enough for the tables and chairs where people are enjoying a bit of al fresco cafe culture. This atmosphere has been created by residents and retailers with a bit of help from planners. 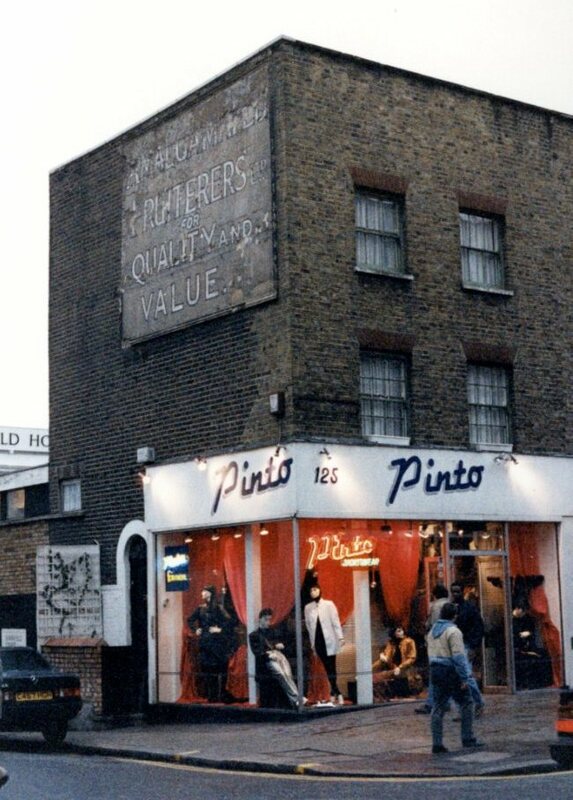 In the North Kensington area it’s a destination in itself. 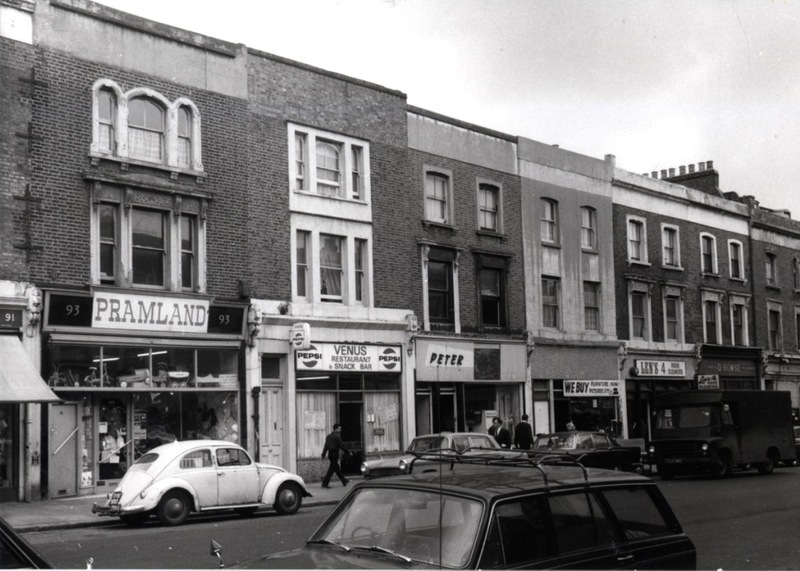 This short stretch of road hasn’t always looked as good as it does today, but forty odd years ago it was still a street of shops. This week’s post is the first of two. 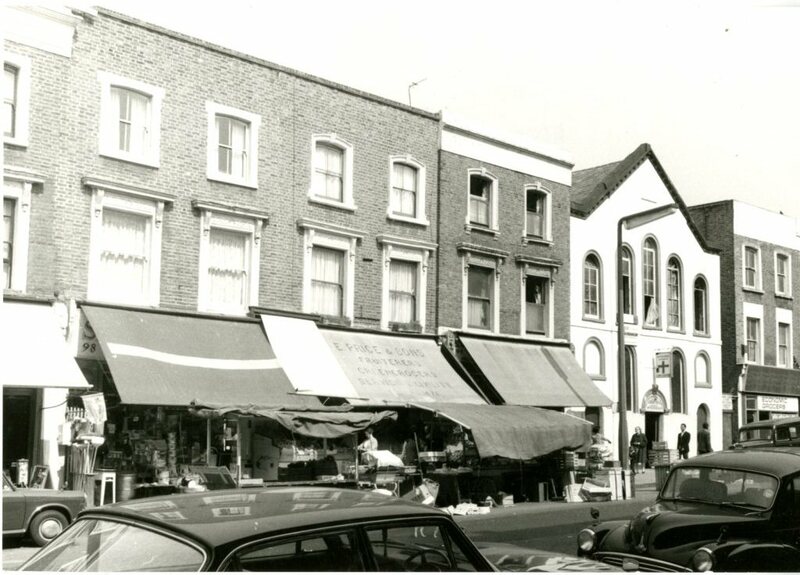 Next week we’ll look at some pictures from the 1990s, but this week we’re picking up the trail near the end of Kensal Road which we took a walk along a few months ago, and returning to 1969 and 1970, when some of the shops in Golborne Road were quite different from today. There’s the edge of the bridge over the railway. 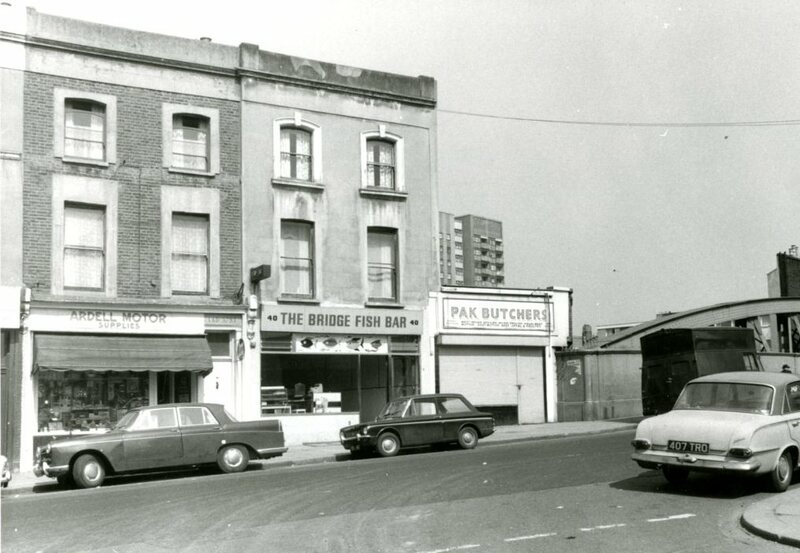 The Bridge Fish Bar, with its motif of fish below the sign is, according to Street View, now concerned with skateboards and related gear (retaining a tenuous connection with the sea?) . Next door the small building which looks like an appendage to the terrace is surprisingly still a halal butcher’s shop, but has dispensed with the name. While the railway bridge is visible we should take a quick look in that direction. Normally you would expect to see something quite tall visible from this point. 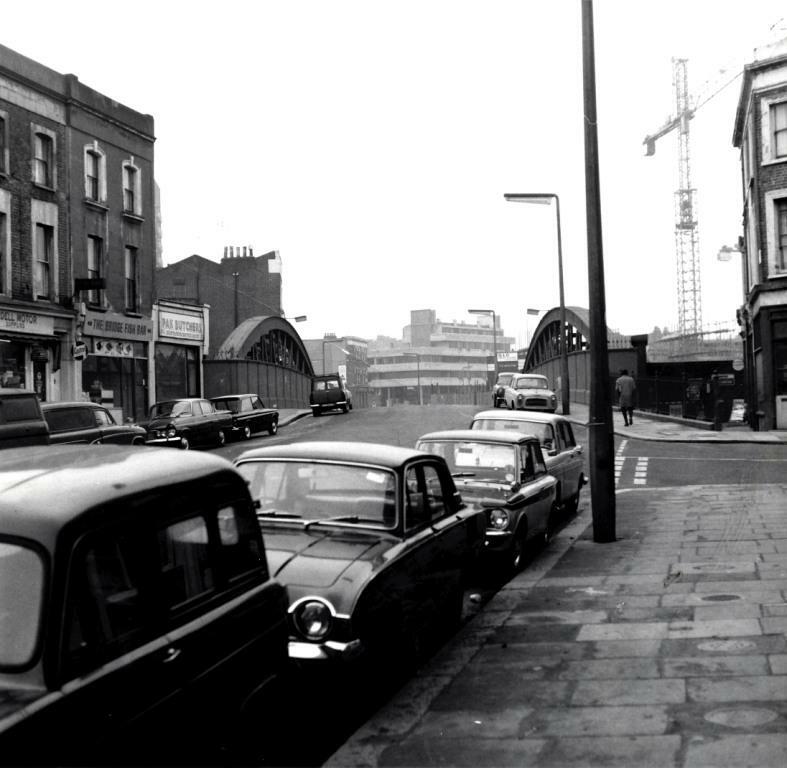 But only the crane gives you the clue that one of North Kensington’s iconic buildings was about to emerge just beyond the bridge. In 1969 all you would have seen was a view like this. The scaffolding and the letters GLC on the hoarding indicate that Trellick Tower was about to rise from the gloomy surroundings. 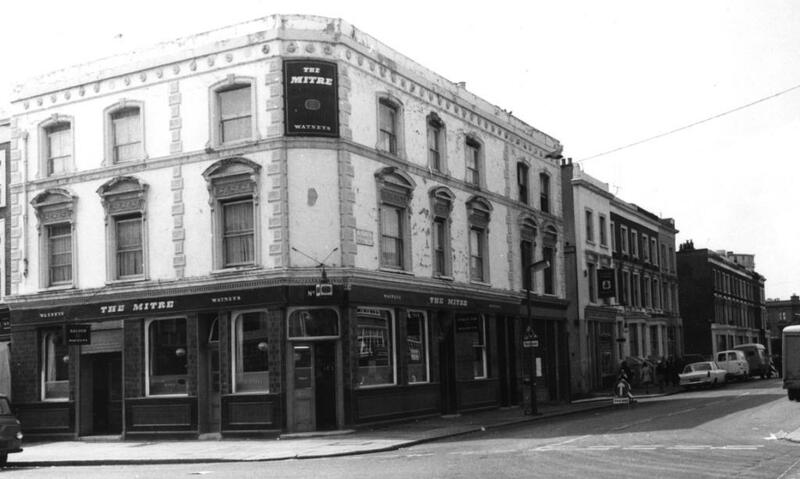 On the corner of Wornington Road, the Mitre public house. The Mitre can also be seen in this picture. It’s unfortunately a bit light, but you can make out EG Hopwood, another butcher, J. Sugarman, (ladies outfitter), Clarke & Co (corn dealers? ), Ryan Electronics and O’Mahoney Brothers (domestic stores). 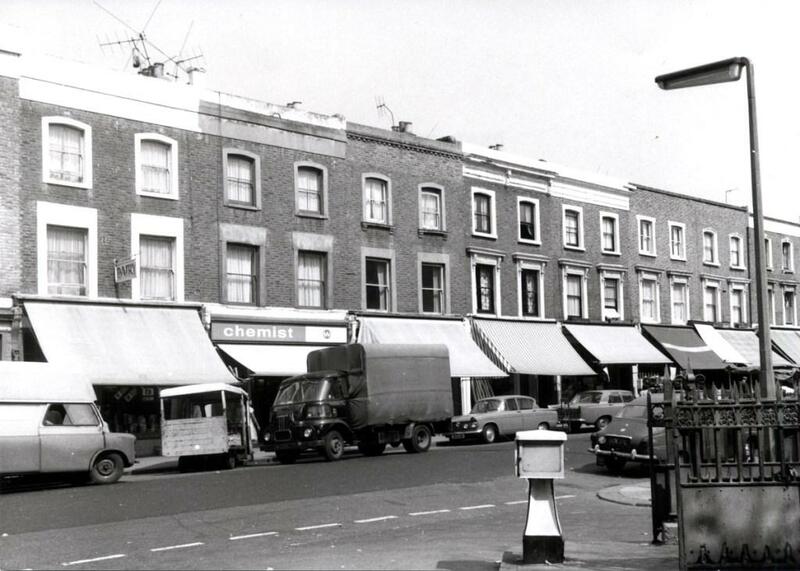 Following the brothers, at number 74 another butcher, E F Cullingford, Pearks Dairies (see the name on the awning, and the milk float parked in front), the Help Yourself Stores (provisions) and on the far left Hamperl, yet another butcher. 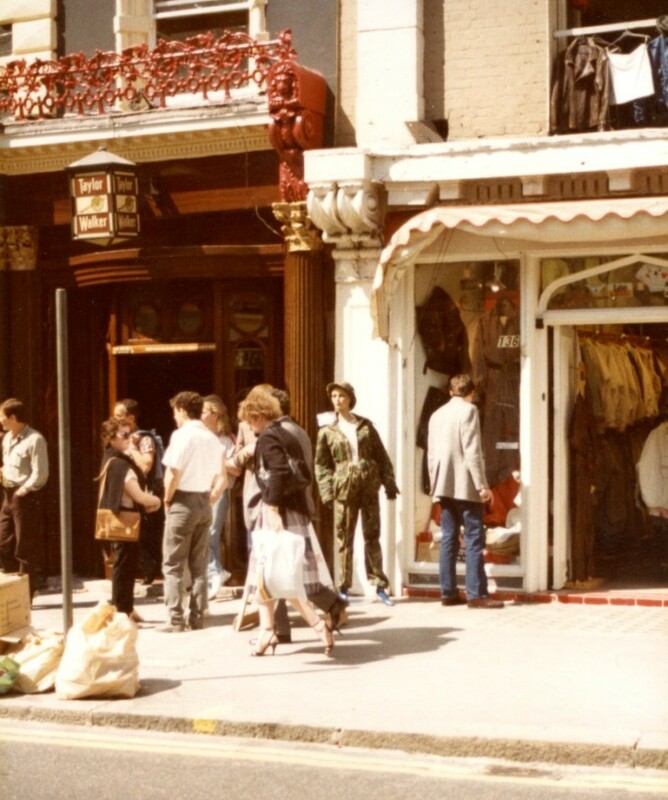 Below, the shop on the right is another ladies outfitters, next to a branch of the Aerated Bread Company, a familiar London institution, more provisions, a draper named Fogel…. And the Economic Grocers ( I hate those uneconomic grocers). 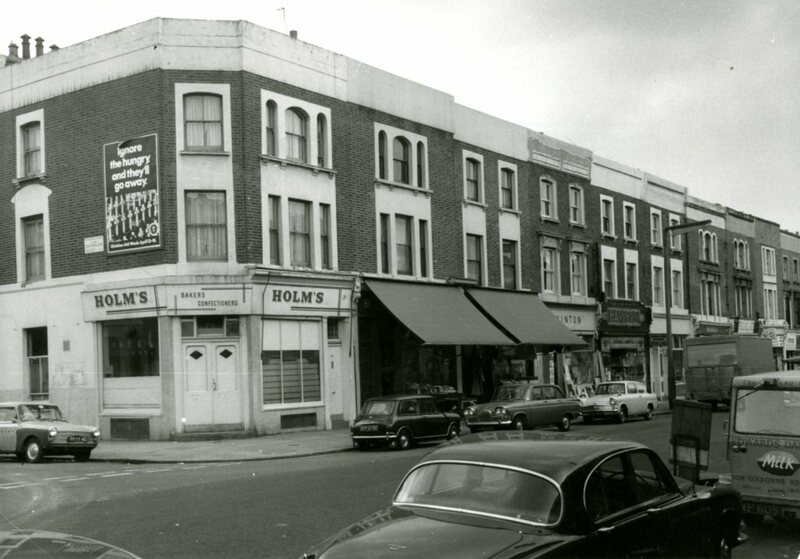 The building which looks like a church is in fact a church, the prosaically named Golborne Road Church. 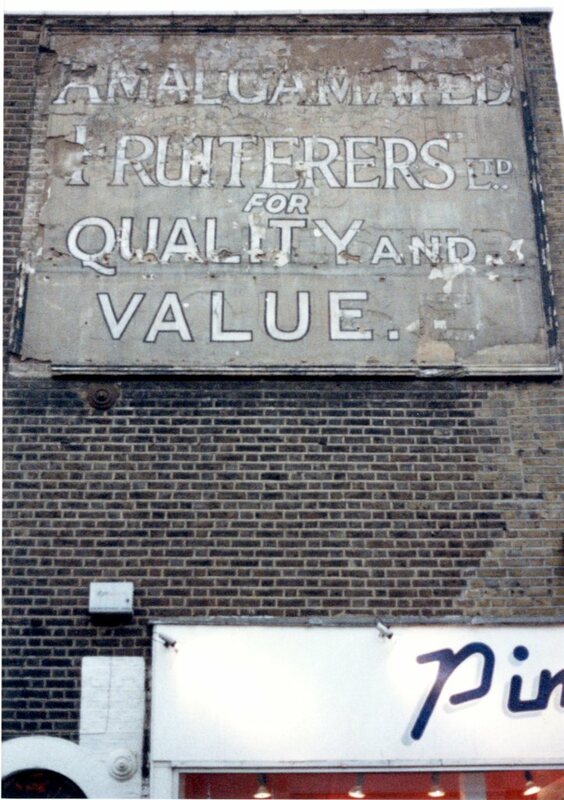 Behind the stalls at number 96, Price and Sons, fruiterers, a name to remember because the slightly expanded Price’s survives to this day. 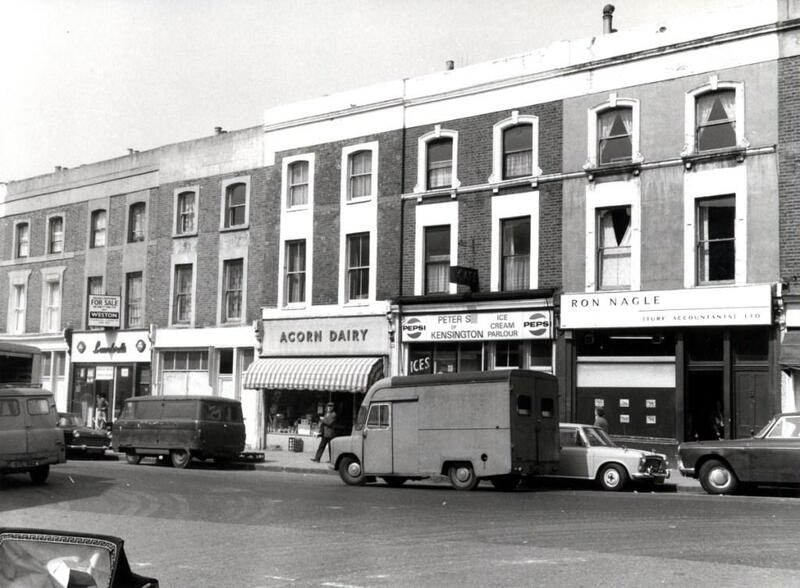 This last picture from the north side of the street shows another butcher, a dairy (with another milk float), a newsagent and, not obscured by an awning, W.E.T. Williams, a chemist. 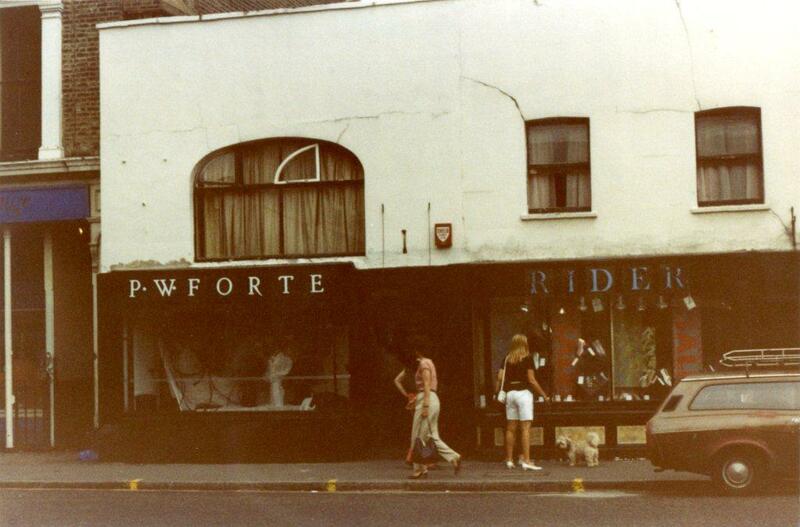 This is the point where Portobello Road crosses Golborne. We also have a few pictures of the south side of the road. 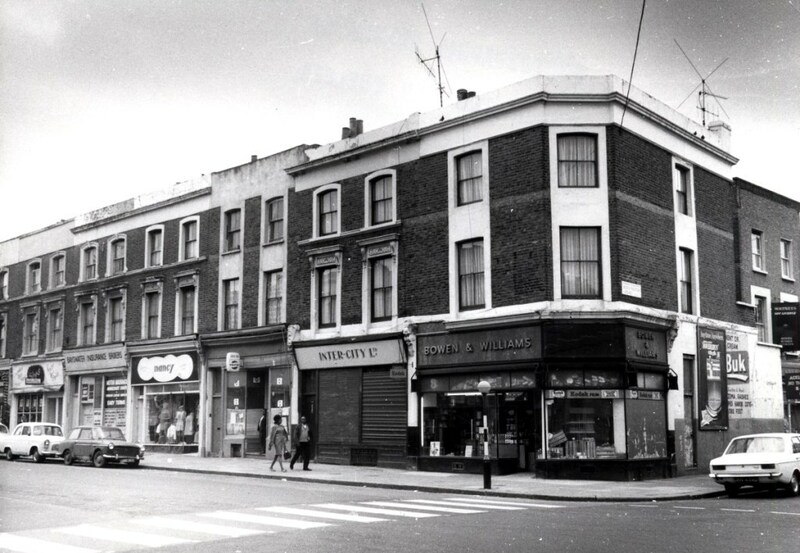 On the corner of Wornington Road, Bowen and Williams, a drug store. My copy of Kelly’s does not list the shop called Nancy but it’s in the place where Doris (gowns) is listed. Perhaps they changed the name. 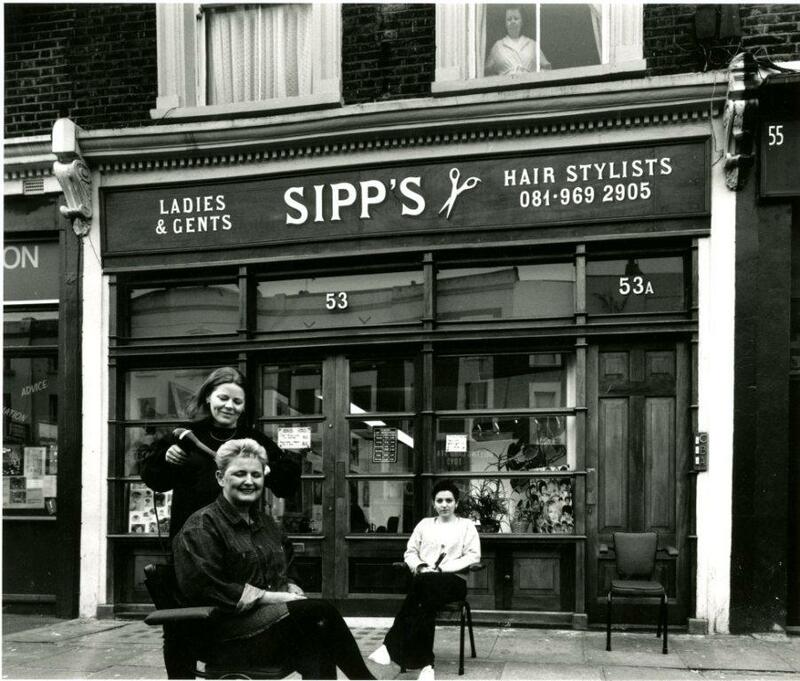 You can just about see Sipp’s, a hairdresser on the far left. 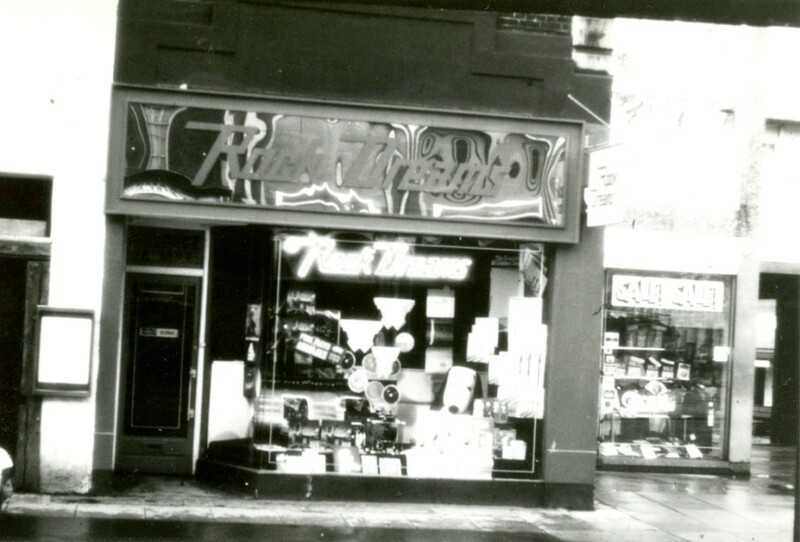 This picture shows Holm’s, a baker and confectioner, at number 79 on the corner of Swinbrook Road. 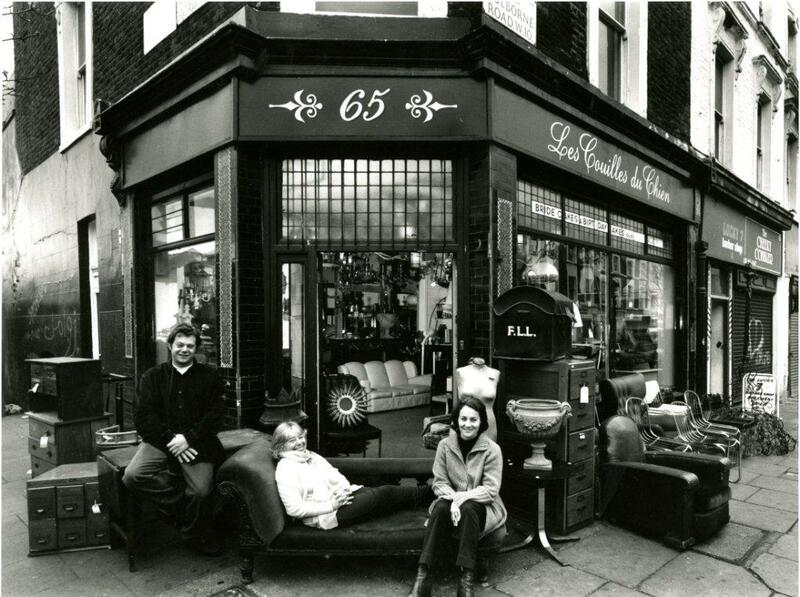 Possibly to cause confusion, Holm’s also had an establishment at number 65. The one I like in the next picture is at number 93. Pramland, dealers in perambulators. 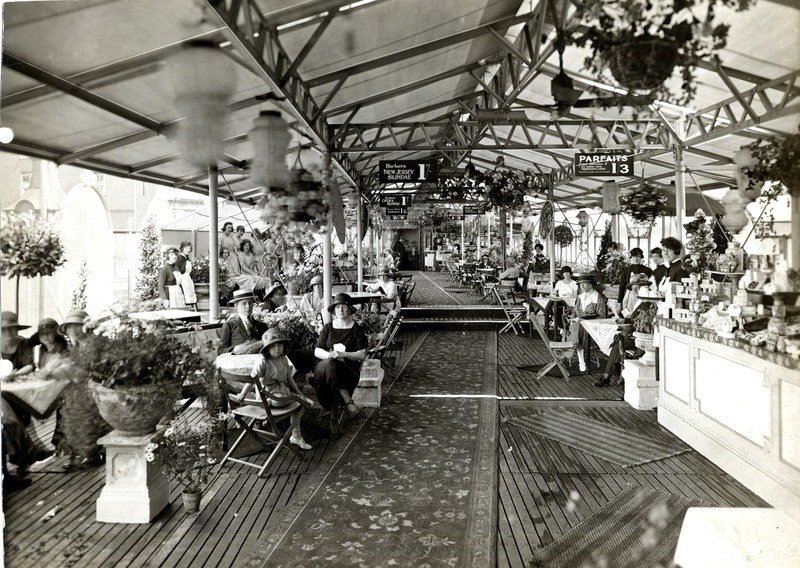 Next to them, the Venus Restaurant. The cryptically named laundry Peter was actually suffering from sign damage. The word Pan is missing. 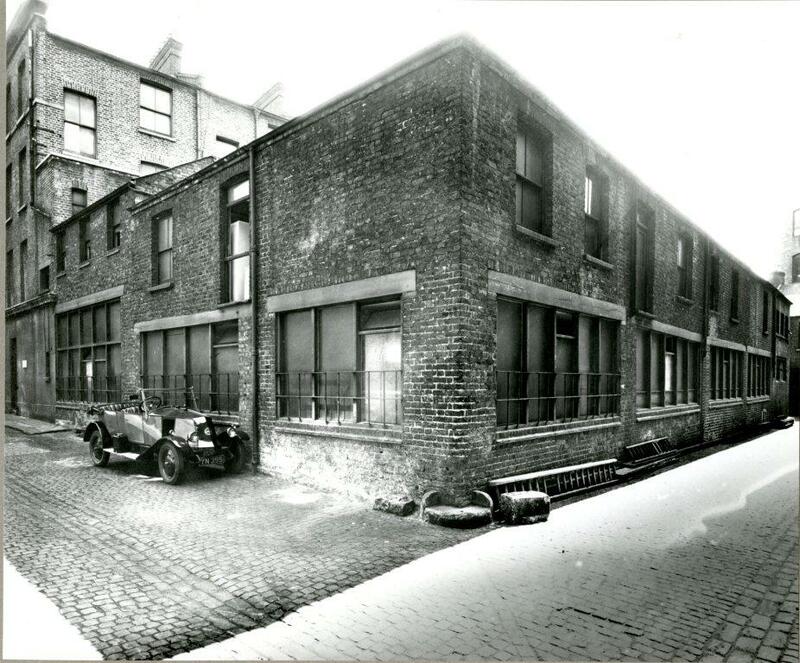 You can barely make it out but at number 103 was D Howse & Co, surgical equipment manufacturers. For such a specialised business, I imagine it didn’t matter where they were located. You can see them from the other angle in the picture below. 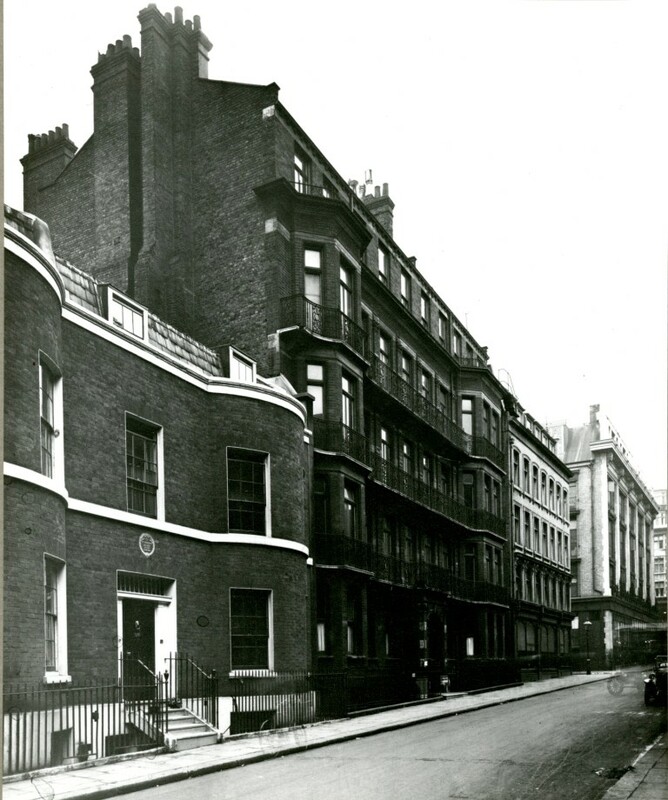 In the foreground, on the corner of Bevington Road, W. Rewer, dental laboratory (any connection with their neighbours?) They boast a “same day denture repair service”. If your dentures needed a hurried repair, that was clearly the place to go, although I must say that the shopfront doesn’t inspire confidence. 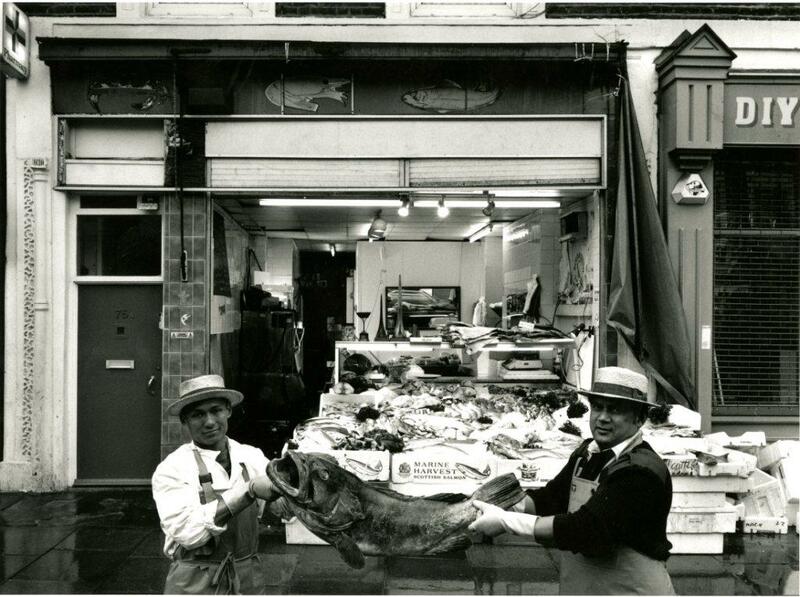 The man dressed in white could possibly be one of the many butchers out for a stroll to clear his head. I have avoided bringing cars into this post as I was concentrating on shops, but car enthusiasts are nevertheless invited to identify any intriguing vehicles. These pictures always contain a few interesting examples. I have made extensive use this week of Kelly’s Post Office London Directory for 1969, an invaluable tool for the local historian. 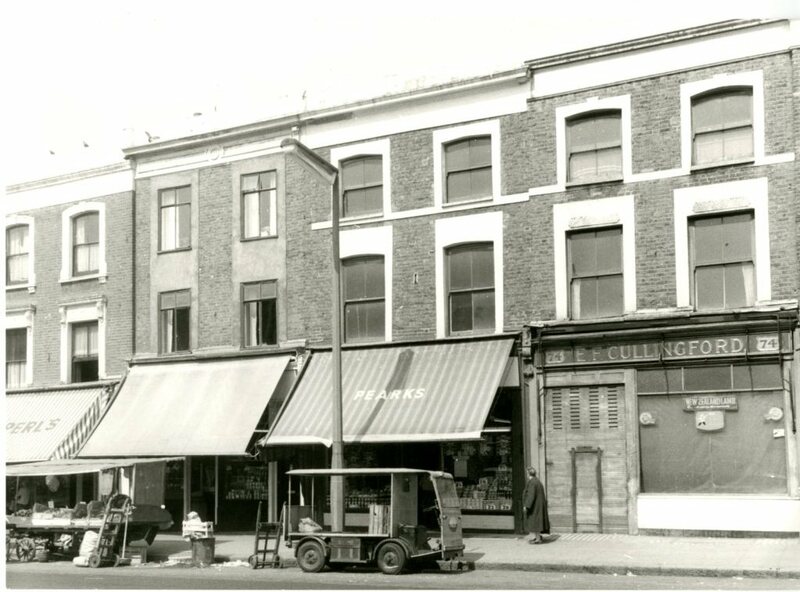 Next week’s pictures come from the HistoryTalk collection and they take the story of Golborne Road retailing into another era. I began to wonder if there were other American authors I should make more of an effort with. I’ve got Thomas Pynchon covered. I’ve read a couple by Don Delillo. Maybe I should make more of an effort with Joyce Carol Oates, serious novelist and cat enthusiast. I admit it though: my favourite American novelist is William Gibson, and I never miss new books by Michael Connelly and Jonathan Kellerman. We’ve had a few visits to the King’s Road in recent months. No sooner had I introduced you to the work of Bill Figg than my old friend CC came along with some equally interesting (and technically superior) pictures. 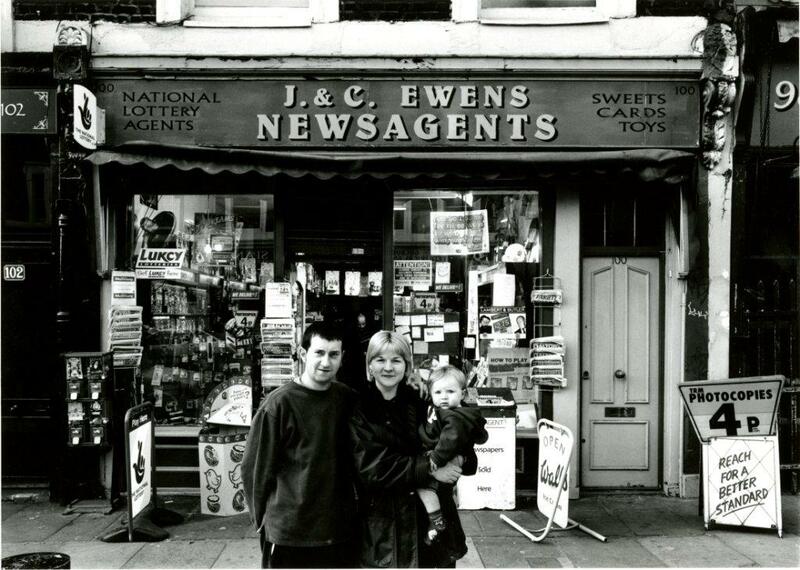 I initially divided CC’s pictures into people and shopfronts, but the photos she has recently allowed me to scan are a mixture of the two, and best of all, there are several posts’ worth, so you can expect to see more of them over the coming weeks. To anyone who asks the question: Dave, aren’t you tired of the King’s Road? My answer is always: No, you can never have too many pictures of that ever changing thoroughfare, and those of us who live nearby will probably never tire of it. 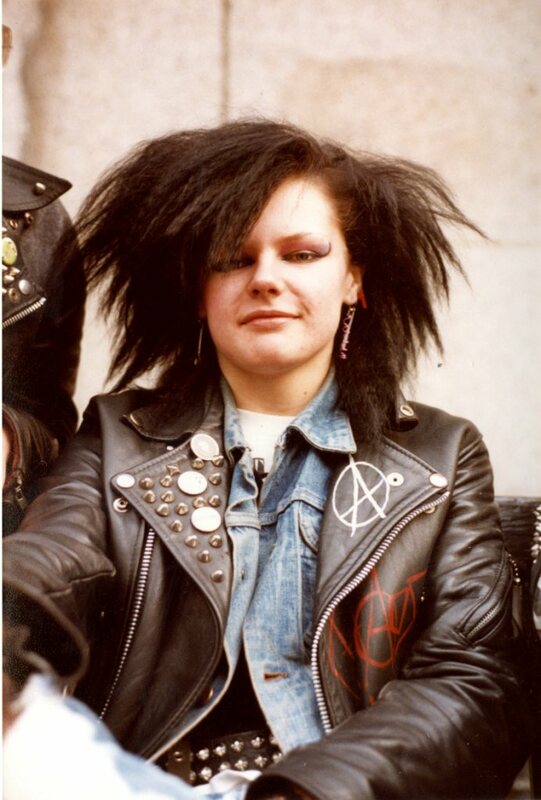 As I’ve been examining then, I’ve seen pictures of individuals, and locations. This post has some of both, and this one which combines the two. The lightly clad gentleman and his snake (it is a snake isn’t it?) 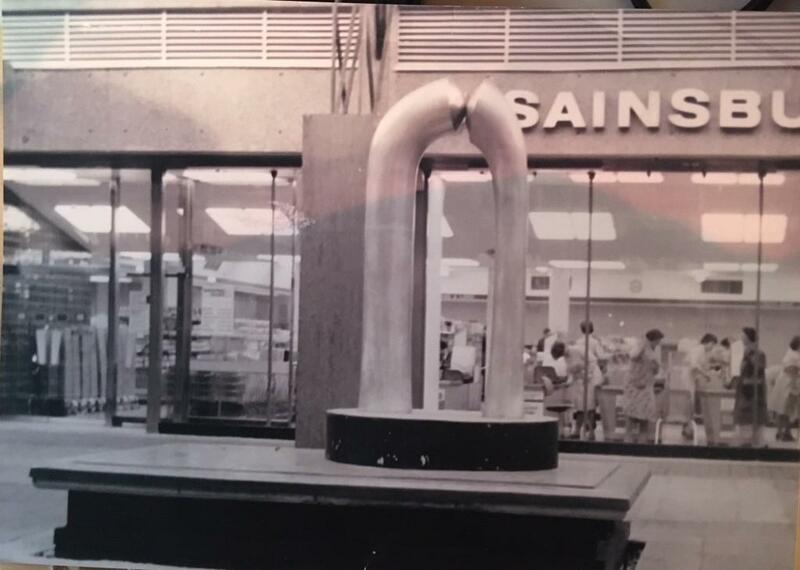 are standing in the old Sainsburys / Boots area (with its now identified sculpture, thanks to a knowledgeable reader ) which at one time I had no pictures of, but now there are several. Here it sneaks into another picture. 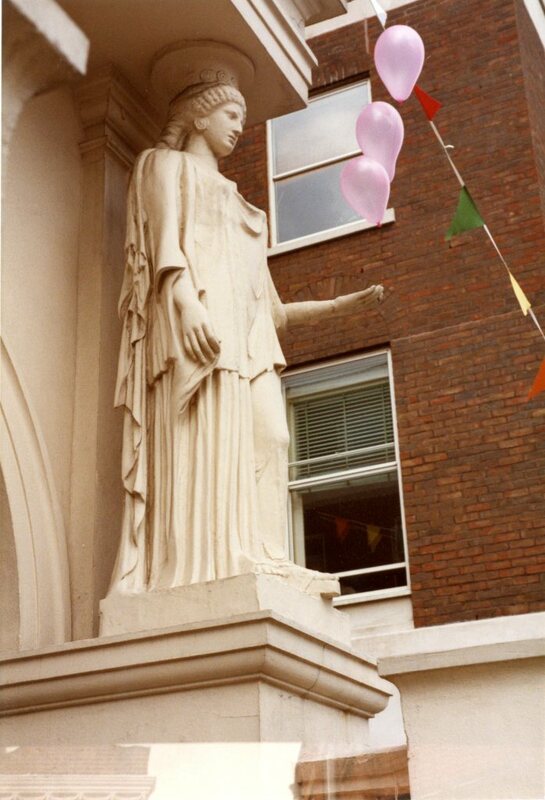 You can just see the edge of the sculpture. 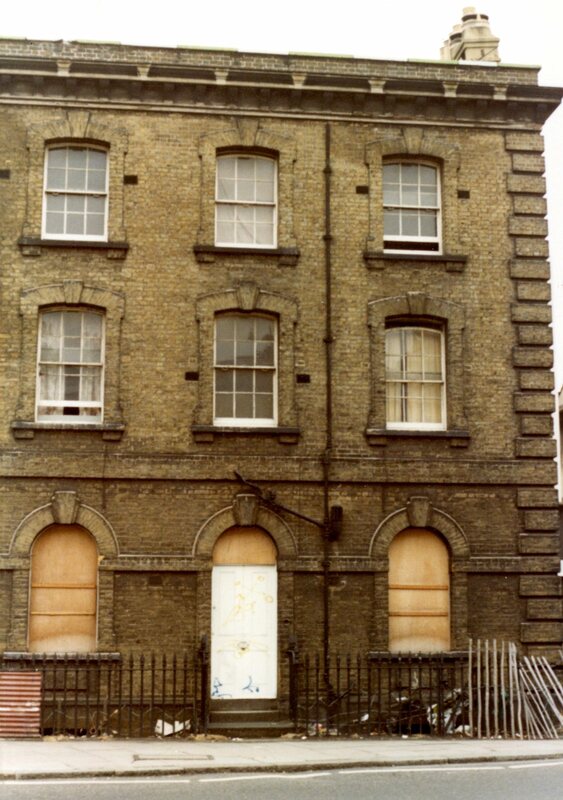 At the other end of the street, a view of the former police station on the corner of Milmans Street. 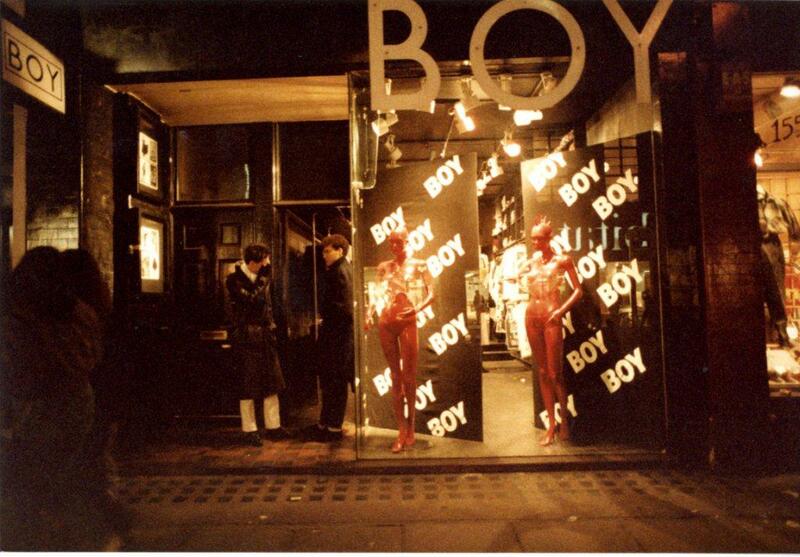 One the left, obscured by scaffolding a shop called 20th Century Box. We’ve passed this spot before. Now, of course, a survivor at the edge of a new development. Some buildings survive though the shops in them change. 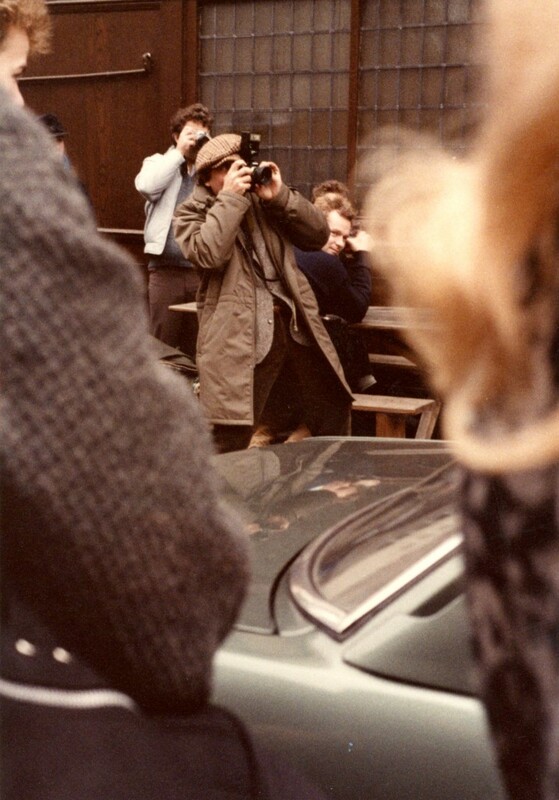 Lord John, at number 72. Some messages are more long lasting, and the same point is still being made. 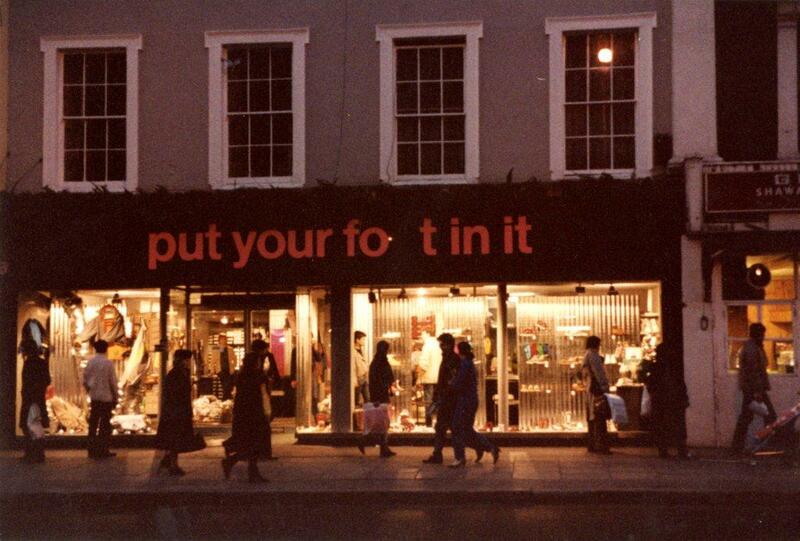 I don’t remember this shop, but thanks to failing light bulbs I won’t forget ot. Continuing the night time theme, a view of one of CC’s regular stops. One more theme to come is looking above the shopfronts at what can be seen above, something I’ve always wanted to do in other Kensington and Chelsea streets. Here you see a now obliterated ghost sign. Close up. The wall above Sweaty Betty is now a uniform white. Finally, a couple hanging around by the entrance to Boy. More of the same in a future post. I should perhaps have anticipated this series with a more coherent title from the start, but we’ll see how we go. All this week’s images are copyright by CC who for the moment prefers to remain anonymous, although some of you may know her. Lavish thanks to her once again. I got stuck in one small street and its environs the last time I started looking at Bill Figg’s unfinished draft for a small book on Chelsea in the “then and now” mode. 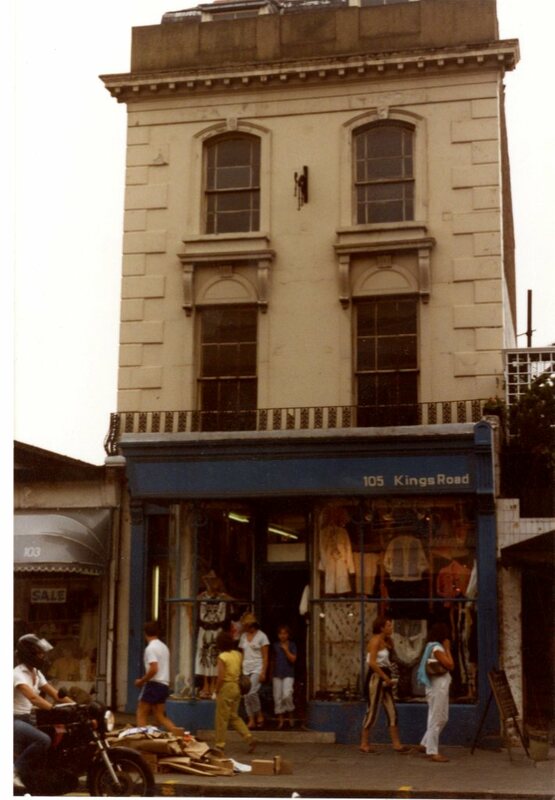 This week I’m going back to that and starting on the main drag with a picture of the King’s Road. 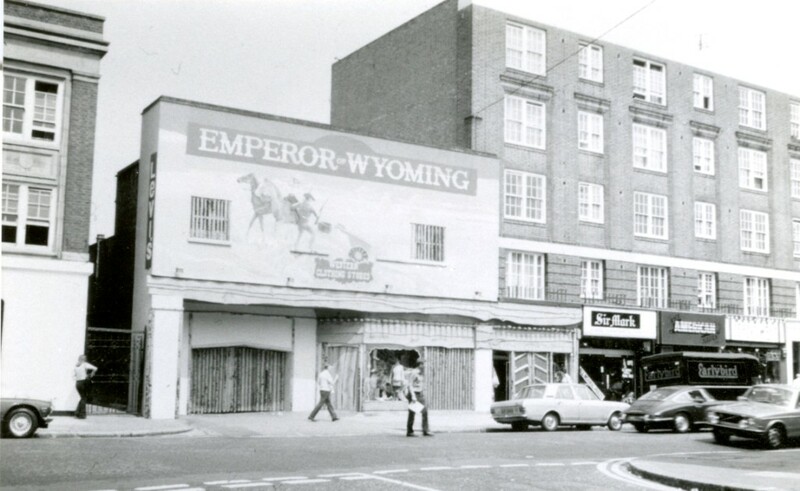 The Emperor of Wyoming was a boutique (remember that word, when it was first used?) named after an instrumental on Neil Young’s first solo album. 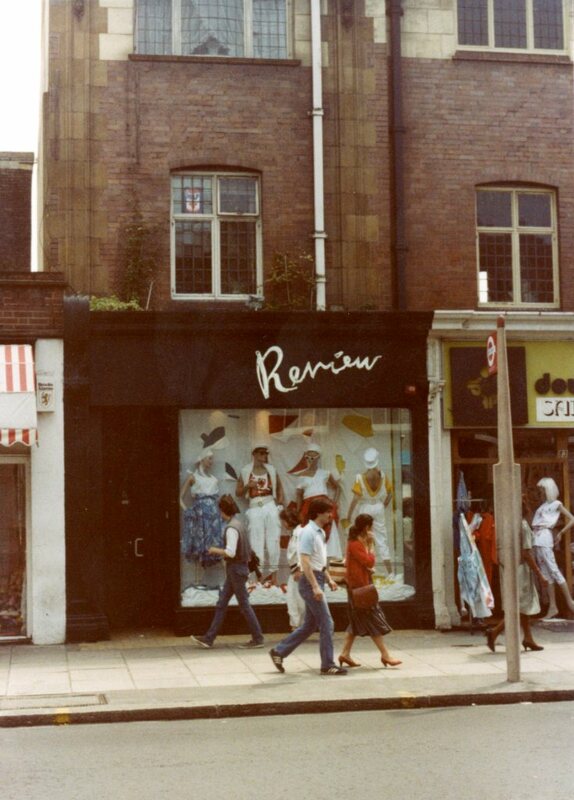 It sold what we would now call vintage Americana, mainly of course jeans, which were imported by the proprietor, Billy Murphy. 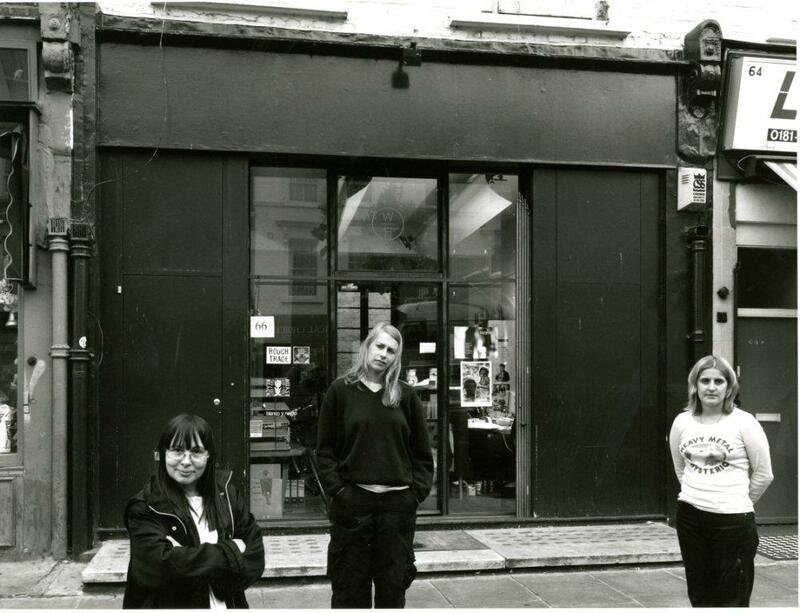 This version of the shop only lasted a few years – Murphy moved to smaller premises near the World’s End. 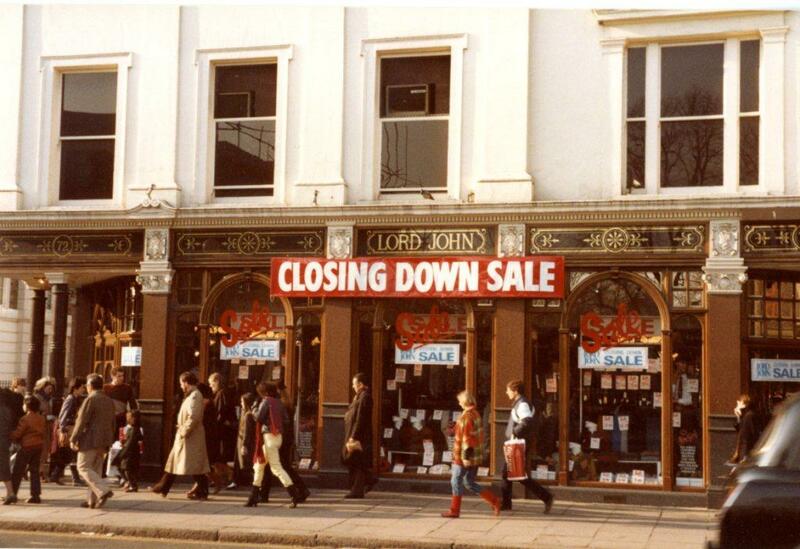 (I don’t have a picture of that shop.) 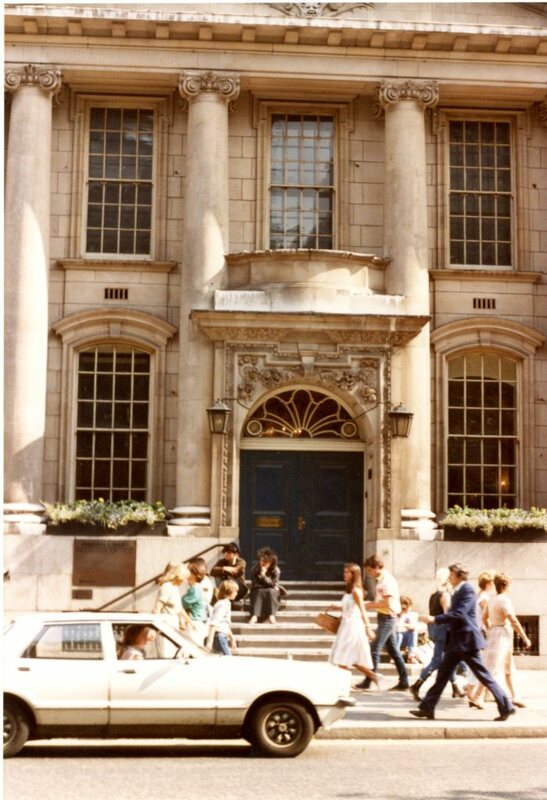 Figg did a “now” picture of the building in the early 1980s. This is one of Figg’s tentative, almost surreptitious, pictures, a little out of focus. 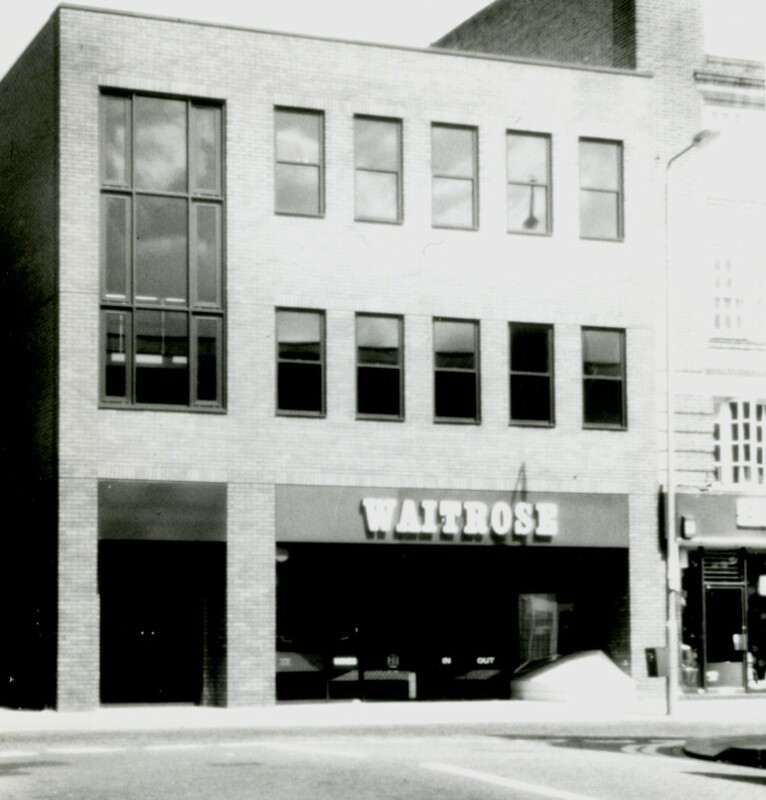 I can remember this branch of Waitrose opening. My wife and I were impressed with how spacious it was compared to the other supermarkets in the area. I particularly recall a large display of seafood in large glass jars. Octopus tentacles floating in brine. Despite what friends have told me, I have never enjoyed the texture of invertebrate flesh. But let’s not go any further with that. 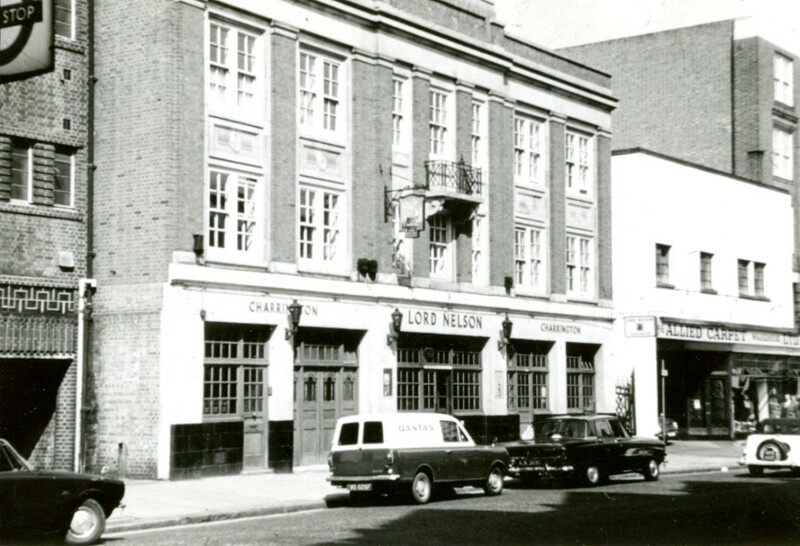 The pub under its original, but related name, the Lord Nelson. 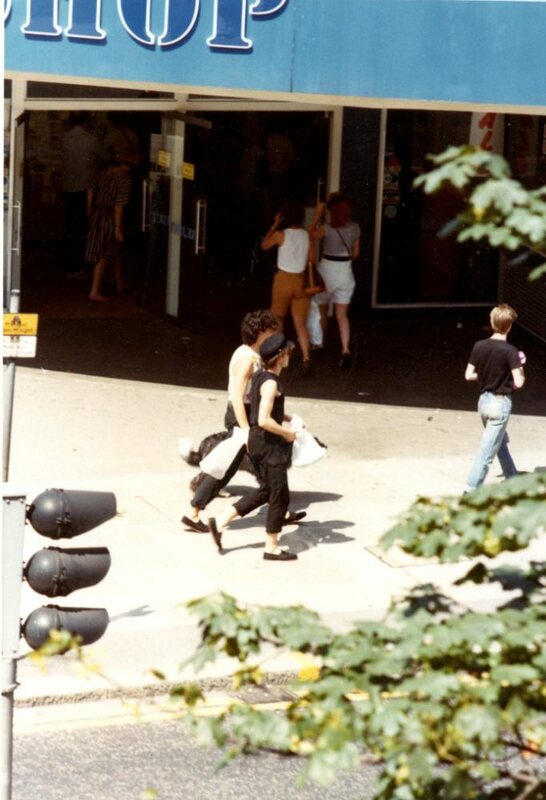 Note on the edges of the picture, a decorative feature on the cinema building, the Odeon at the time (Some of the decoration on the upper part of the building is still there) and on the other side a branch of Allied Carpets, a well known 70s retailer. 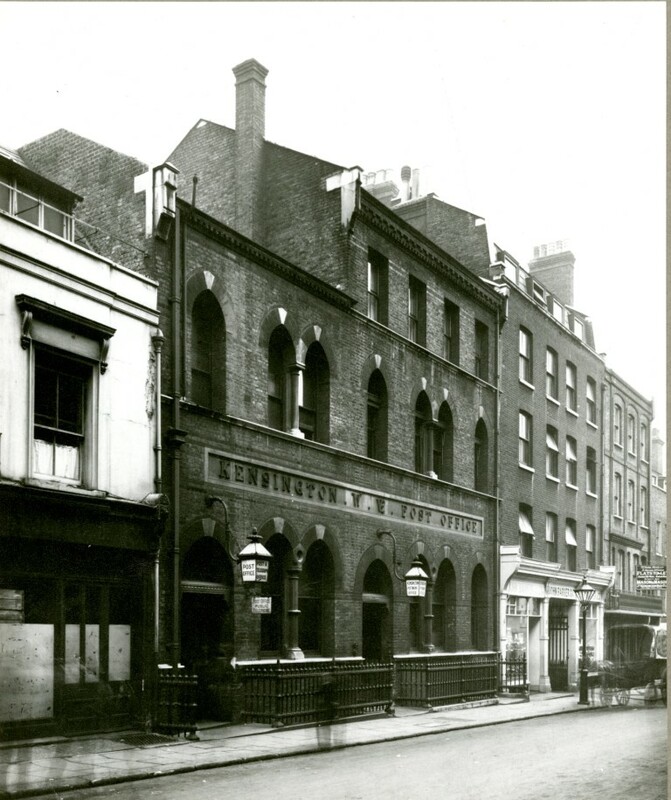 We’re going to move up the King’s Road, as we have before and probably will continue to do so as I explore Figg’s legacy so I have to apologise for a little repetition along the way. 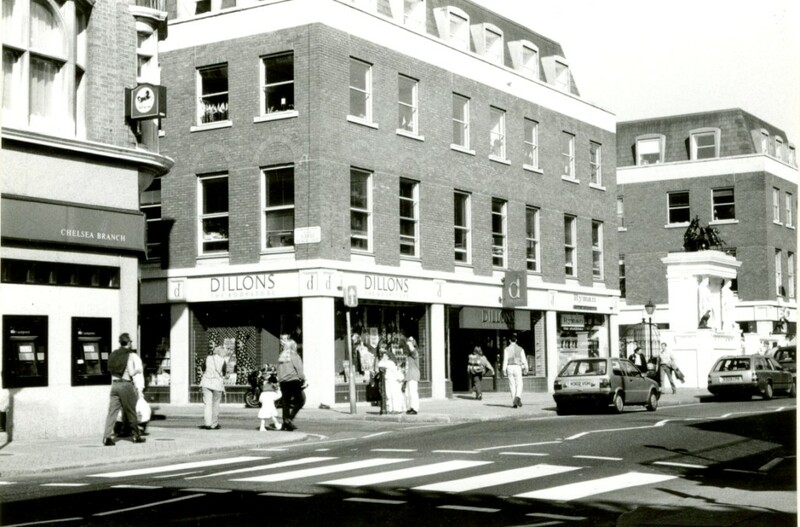 This picture shows the junction with Jubilee Place. 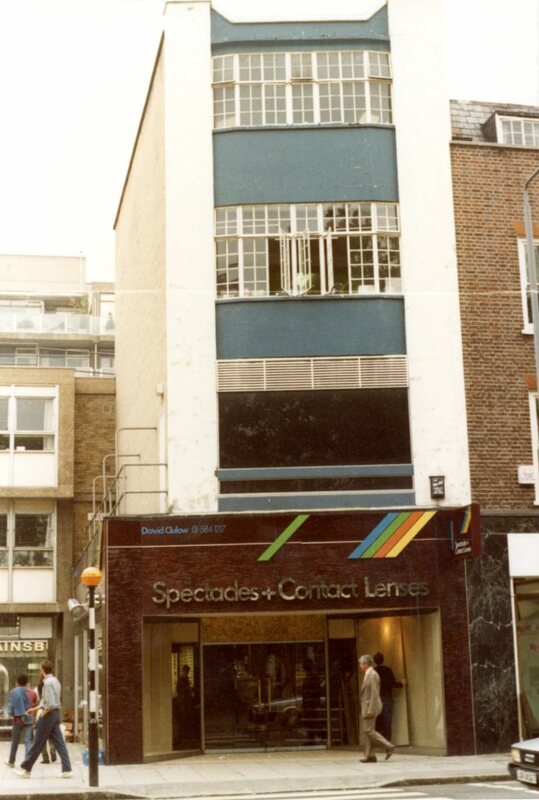 The former Lloyds Bank building is still there occupied by fashion retailer LK Bennett. 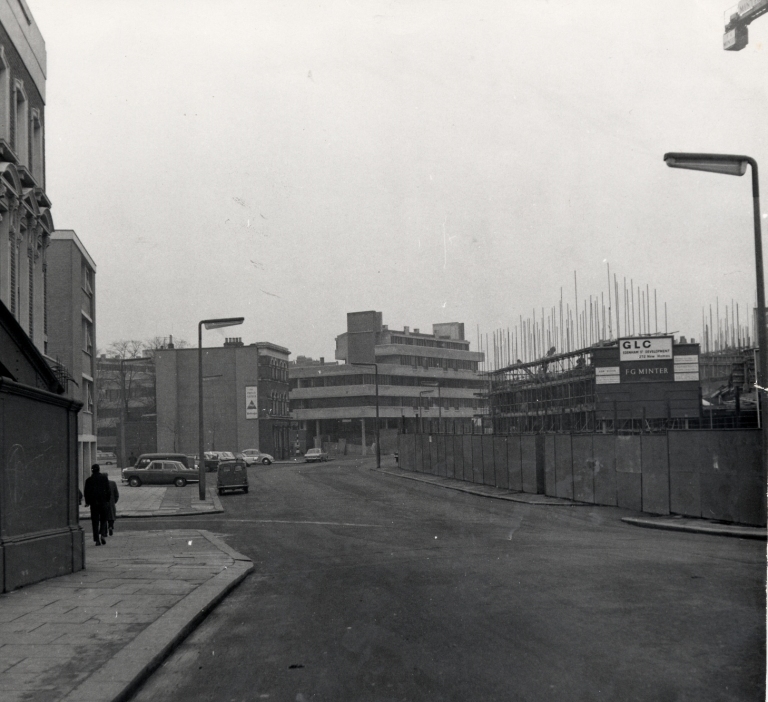 But the buildings east of the junction which look as though they’re still there are actually gone. Here they are from the west. 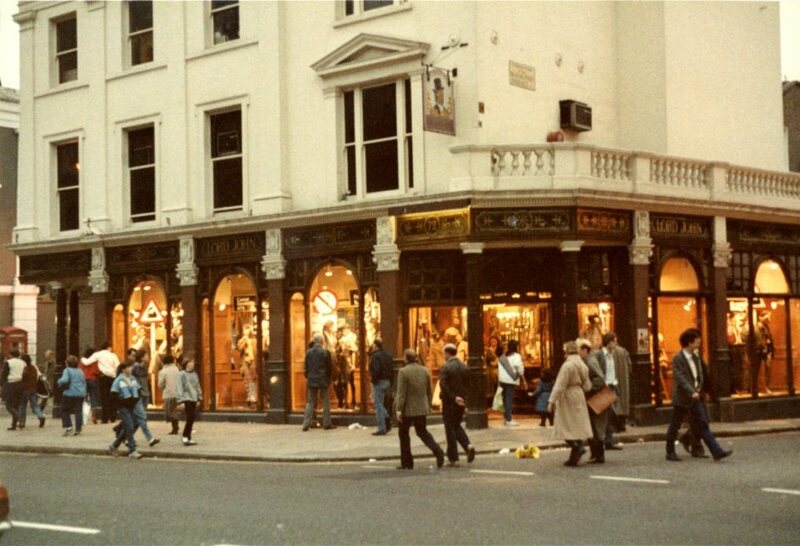 There is the famous shop Kleptomania on the corner. 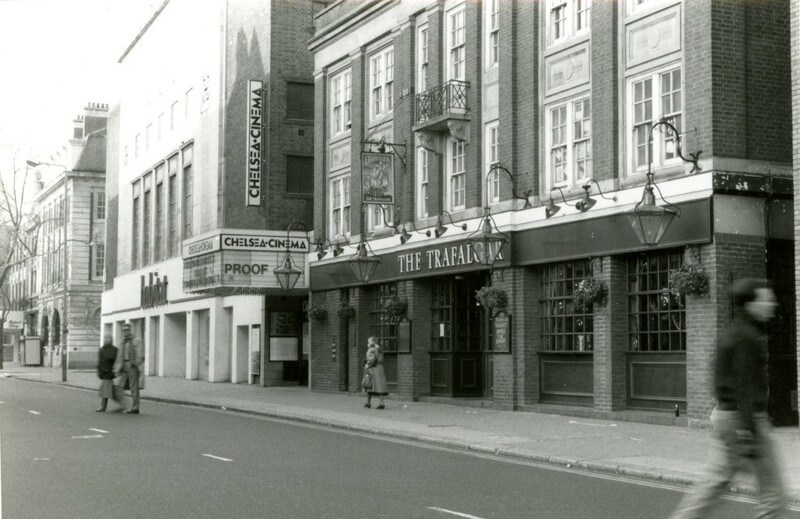 You can just make out the Pheasantry on the right. 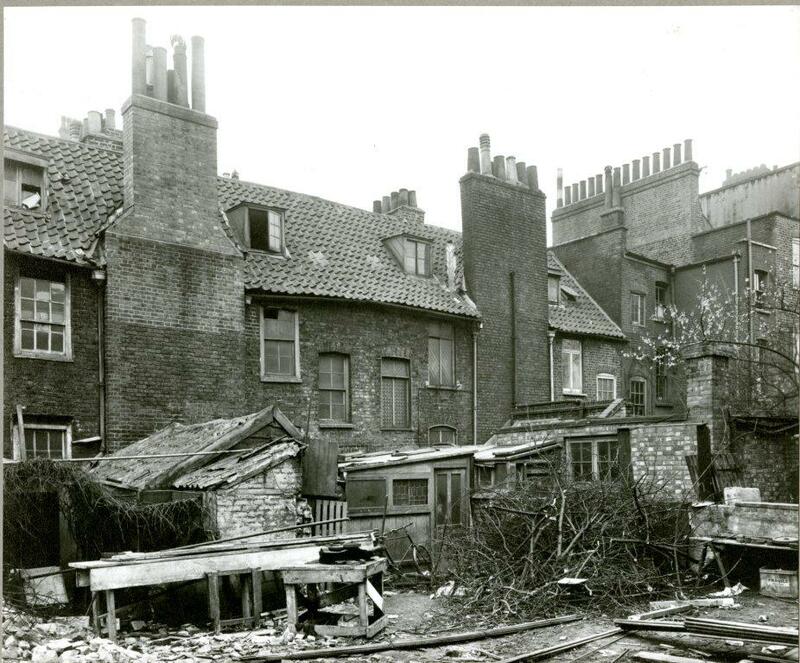 Figg’s “now” pictures shows the modern development which surrounded the Pheasantry. 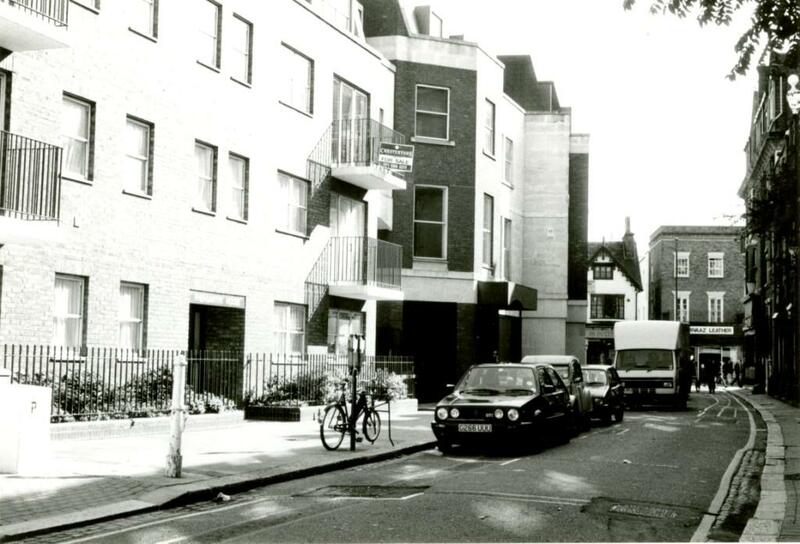 While we’re here we might as well look down Jubilee Place, a narrow street which leads down to Chelsea Green. Note that picturesque turret feature. 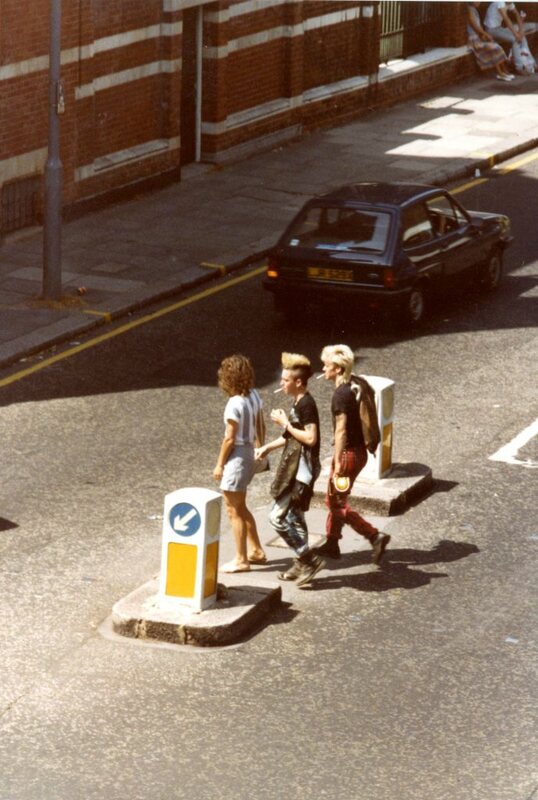 (the King’s Road is in the distance). And the same view a couple of decades later. Like other photographers, Figg has his favourite spots. This is the now version of one of them. 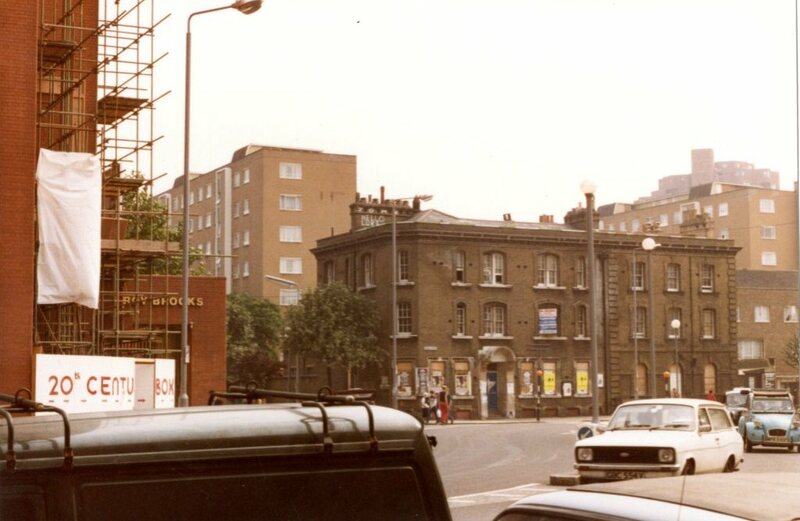 The shadowed entrance to Charles II Place and the Marks and Spencer car park, about 1990. 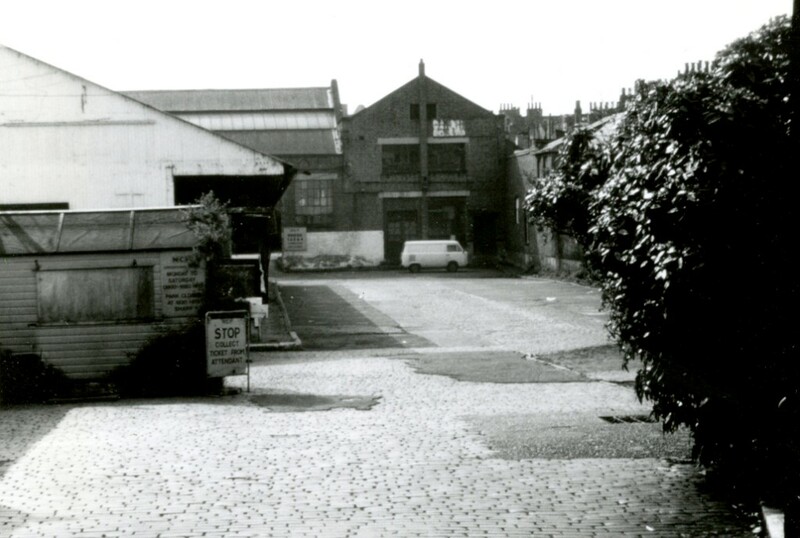 Formerly, the Carter Patterson goods yard, one of the remaining light industrial sites on the King’s Road. Many of Figg’s photos, it must be admitted are not very good technically, or were taken in a hurry. I needed to turn down the brightness on this one to capture the name of the bookseller on the corner of the ramp down to Sainsburys and Boots. 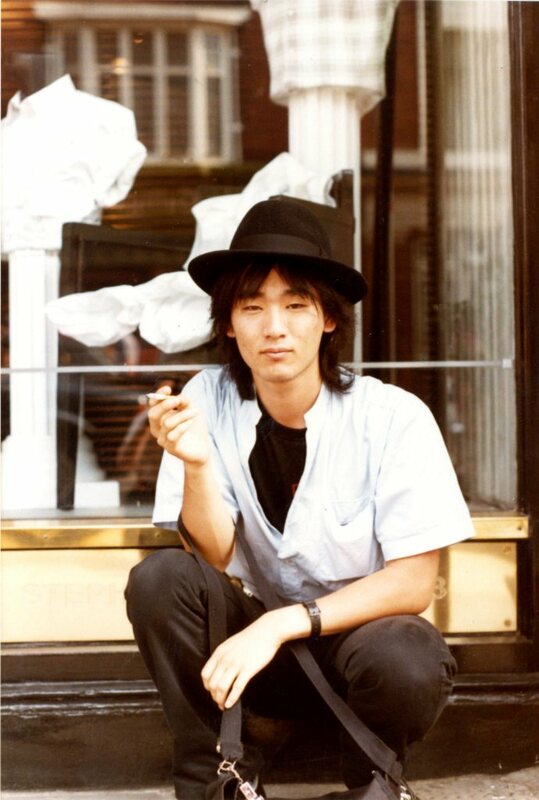 The same shop a little earlier or later, Rock Dreams. This is the view after the miniature mall had filled the gap. Figg did take a picture inside the small precinct, concentrating on a metallic sculpture at the centre of the space. But when I mentioned this area in a previous post someone responded by sending me a picture which is better than Figg’s, so I’m using that one. 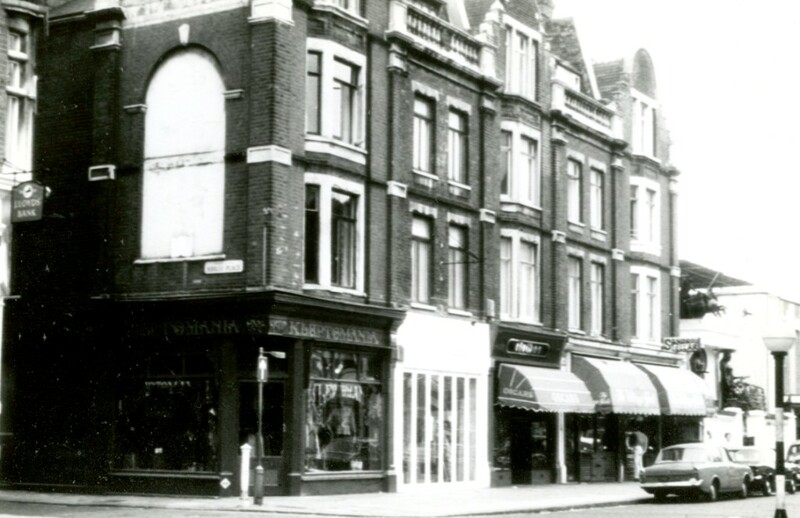 It’s quite appropriate for the history of the King’s Road that we should start with a boutique which became a supermarket and a supermarket which became a mini-mall. 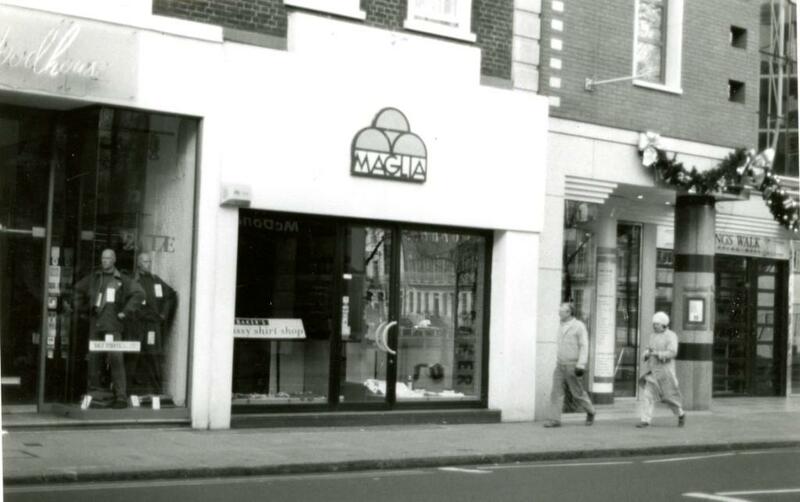 A part of the trend towards the King’s Road becoming a conventional high street. Not there yet though. 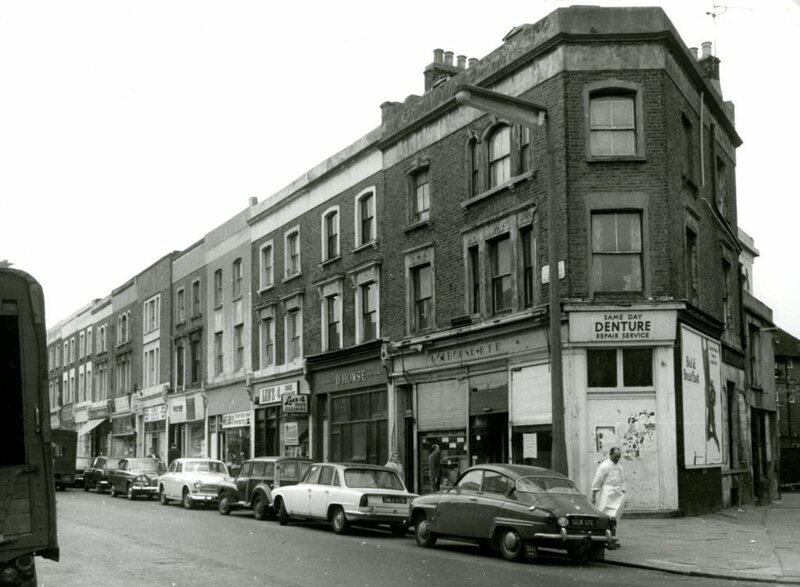 Thanks to everyone who has left comments or sent pictures adding to our collective knowledge about the King’s Road. The nature of blogging is that you sometimes have to go over old ground. 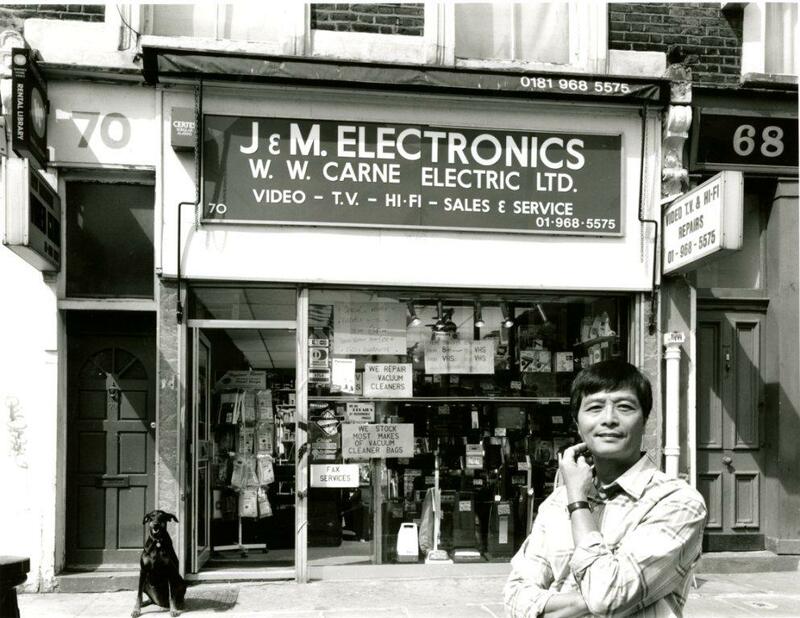 I’m actually hoping for some more pictures of King’s Road shops coming soon. (Hint). The library in the Old Town Hall celebrated its 40 years in the building this year and there is a small exhibition on there right now. 40 years is a bit like Shakespeare’s 400 year a year or so ago. 50 would be a rounder number. But we couldn’t wait for 500 years and who knows what will have happened to libraries by 2028? As it happens this is also my 40th year working in libraries. Another 10 years seems unlikely. But there’s no upper age limit on blogging. 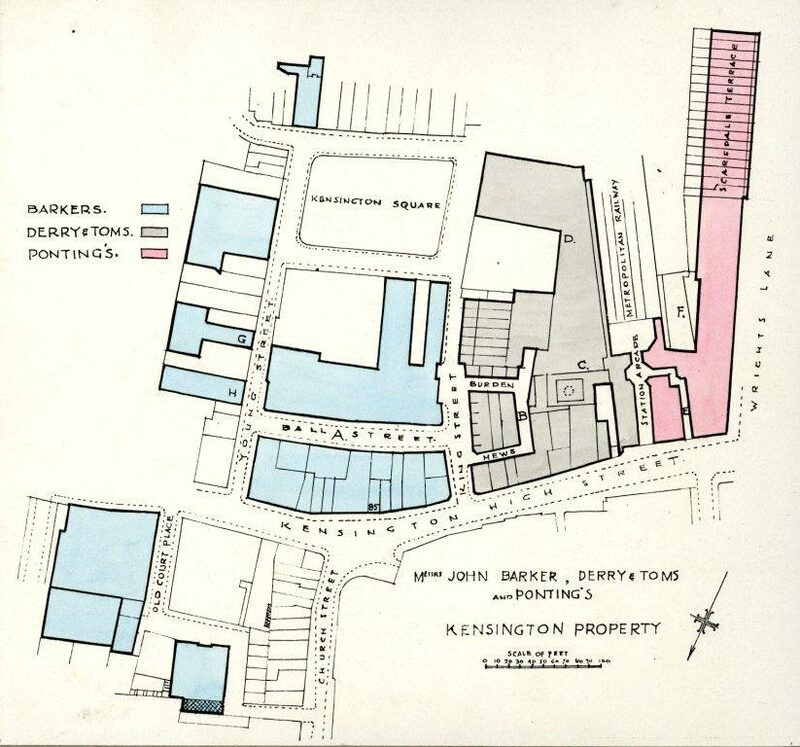 At its height the John Barker Company owned all three of Kensington High Street’s great department stores: Barkers itself, Derry and Toms and Pontings and a few other buildings in the area. 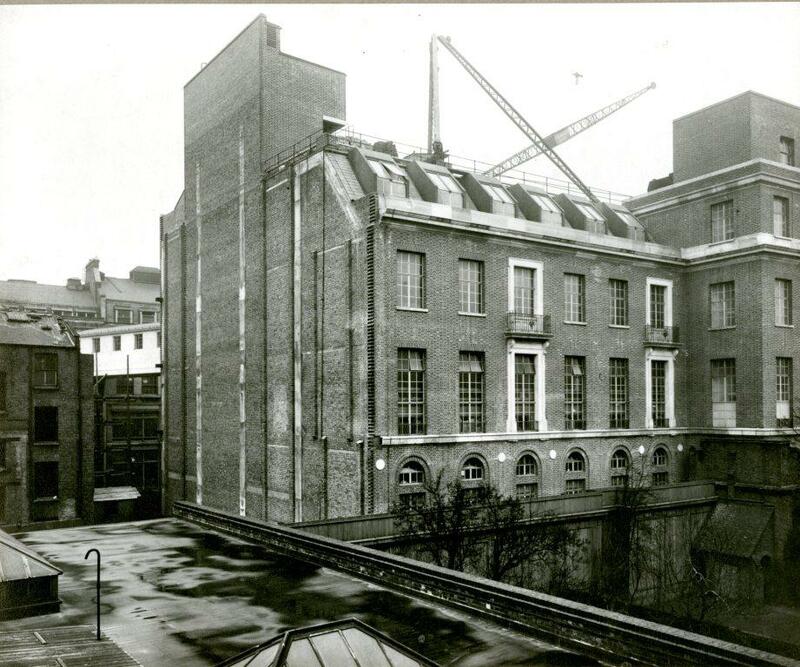 Two of the store buildings remain as reminders of the great era of department store shopping: the Barker’s building itself, home of Whole Foods, Gap and of course Northcliffe House and the Derry and Toms building, home of M&S and H&M, still surmounted by the Roof Garden. (I won’t attempt to say exactly when that era was, pick your favourite: the 30s, the 50s, the 60s?). 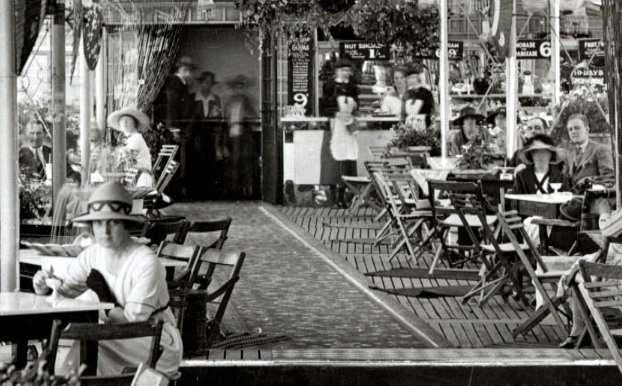 Today’s post takes us back to the 1920s and 1930s to the period before and during the construction of the current Barker’s and Derry and Toms buildings and uses an album of photographs given to the Council by the Company. The whole story of the construction is a long one. You can find a good account of it in the Survey of London which I will not try to compete with. But to summarize: the Company had to acquire all the land it needed and close at least one street for building purposes. 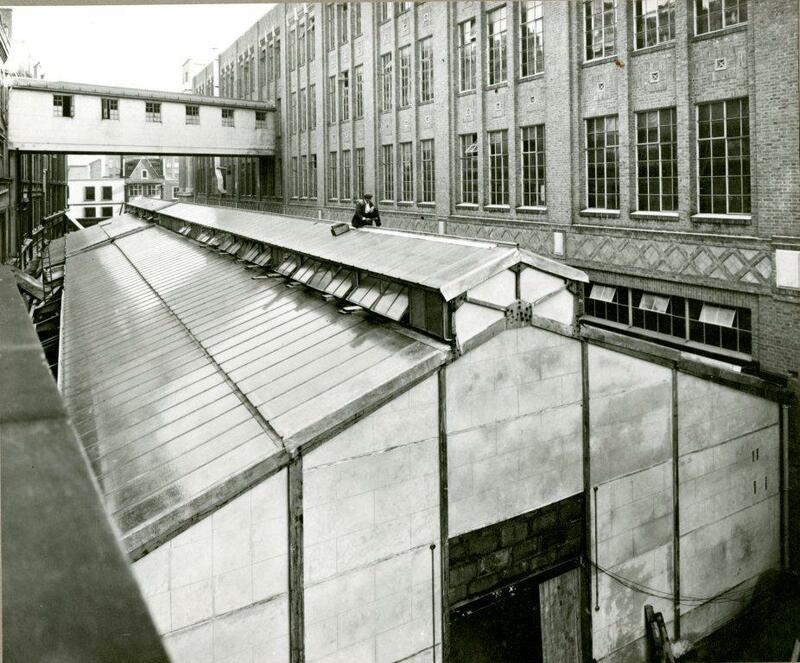 The process of the construction of the new Barker’s was interrupted by the building of the new Derry and Toms (1929-1931) which took over the attention of the Company, and later the Second World War during which operations were suspended so the Barkers building wasn’t completed until 1958. 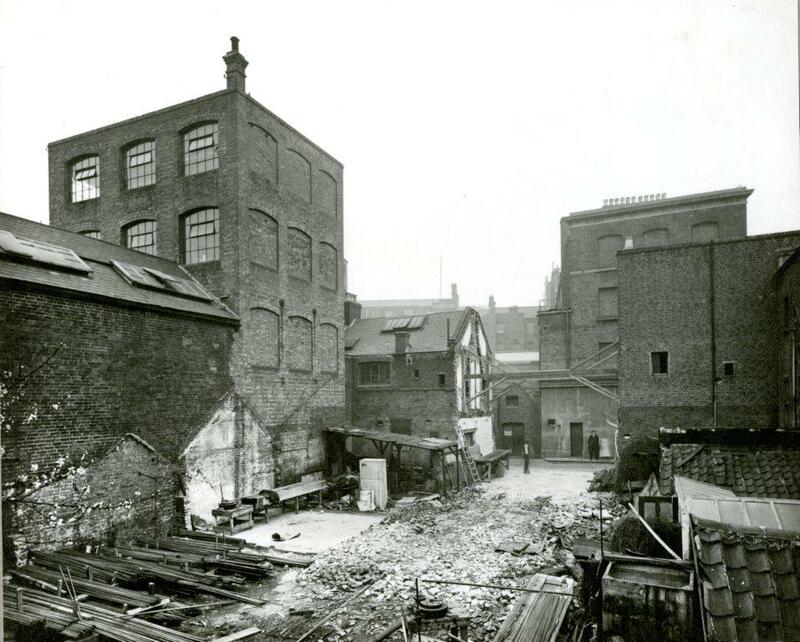 You’ll need a plan to grasp this, but first a picture taken from the corner of Ball Street in October 1924. 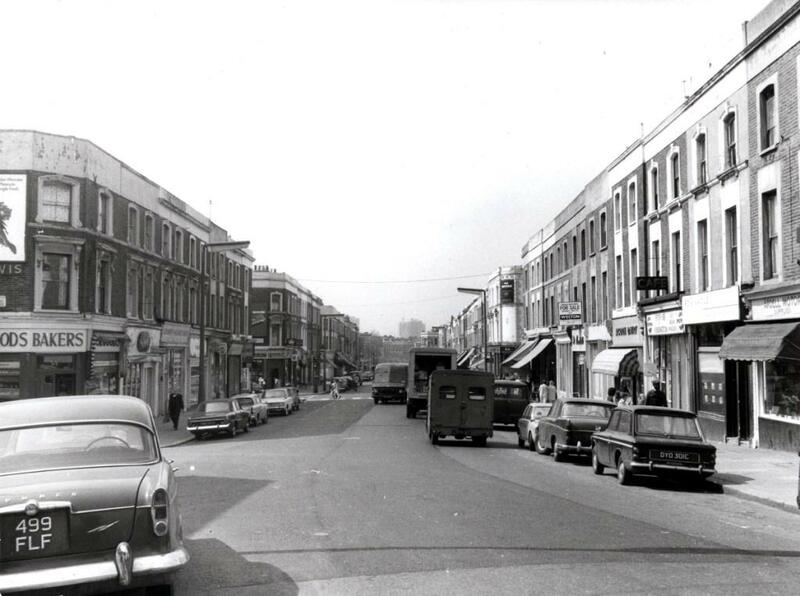 This shows Young Street looking north west. The house in the foreground is Thackeray’s house. 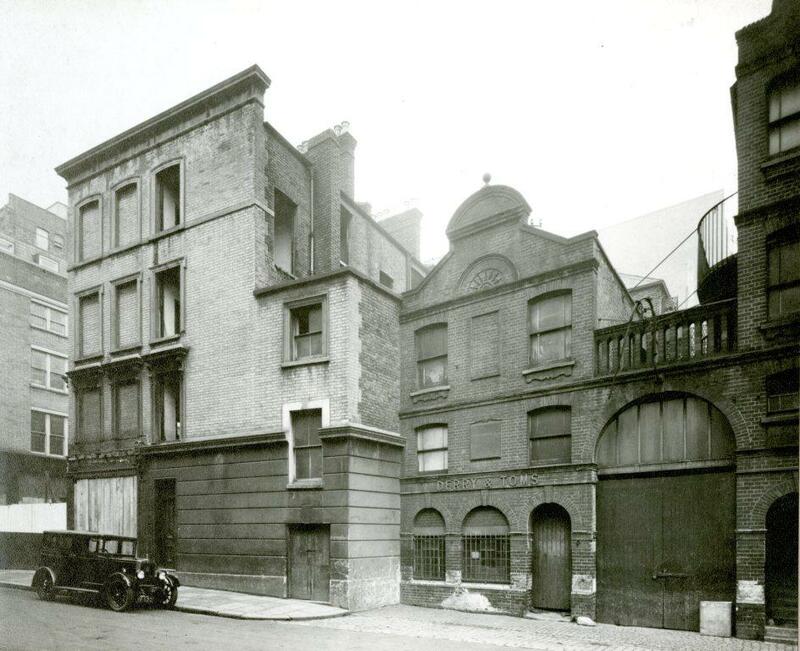 Next to it is Kensington Square Mansions, the first buildings to be demolished to make way for the new Barkers. Carefully colour-coded, as you can see, to show the all the Company’s properties, the three stores, and Ball Street. 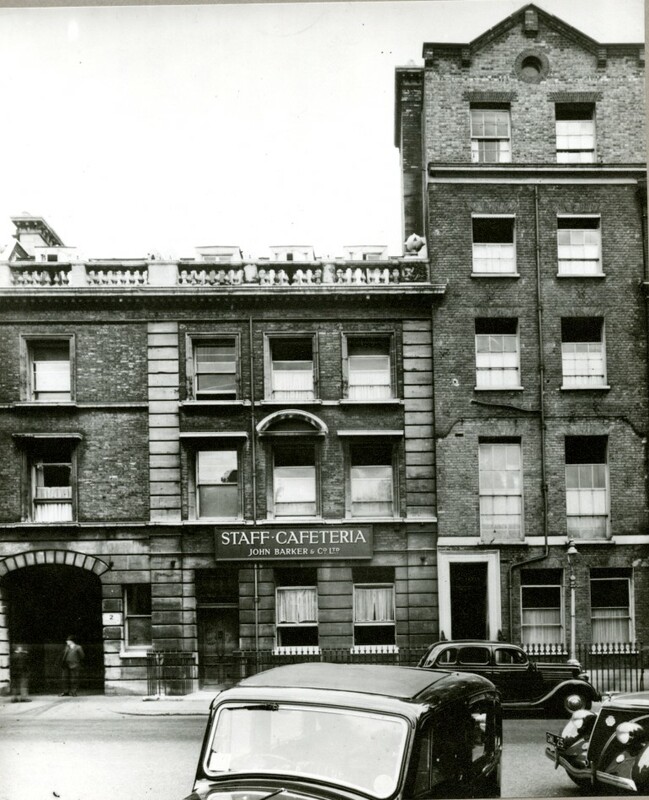 Young Street has retained its name but King Street is now called Derry Street for obvious reasons. 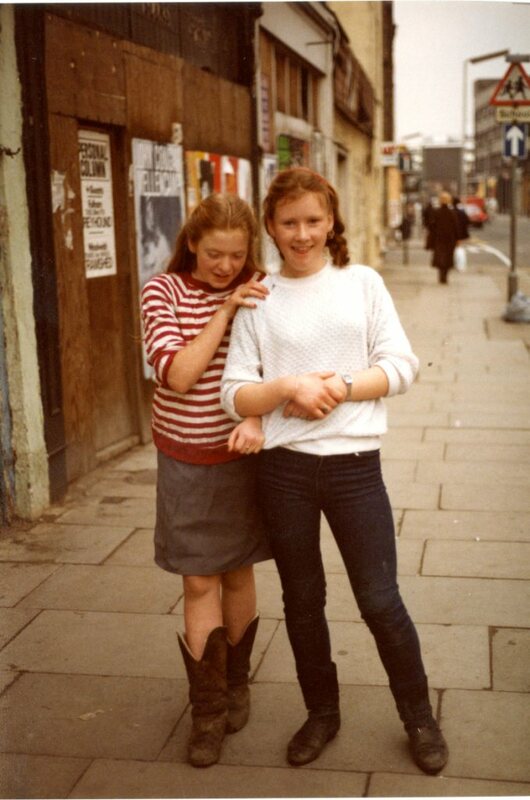 This is also Young Street. 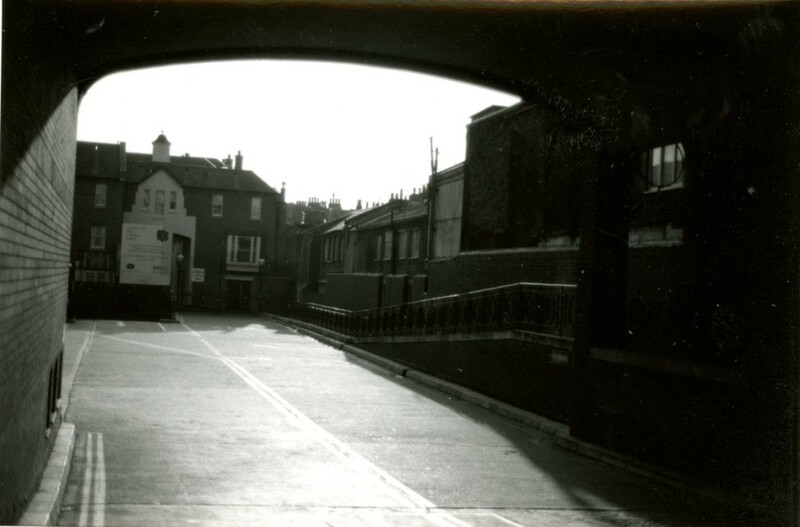 In the centre is the Post Office sorting office, and beside it the entrance to the Bakery and Cooked Meats Kitchens. 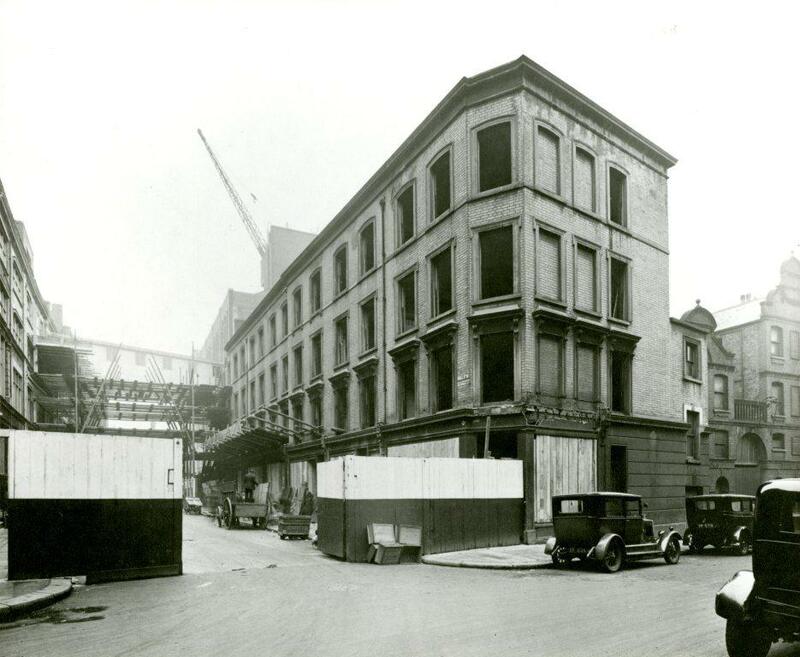 This picture shows Ball Street on January 11th 1928, the day the hoarding to close Ball Street was erected. The rear of Ball Street with the ghostly spire of St Mary Abbots Church rising in the distance. The point of view shifts east in this picture. 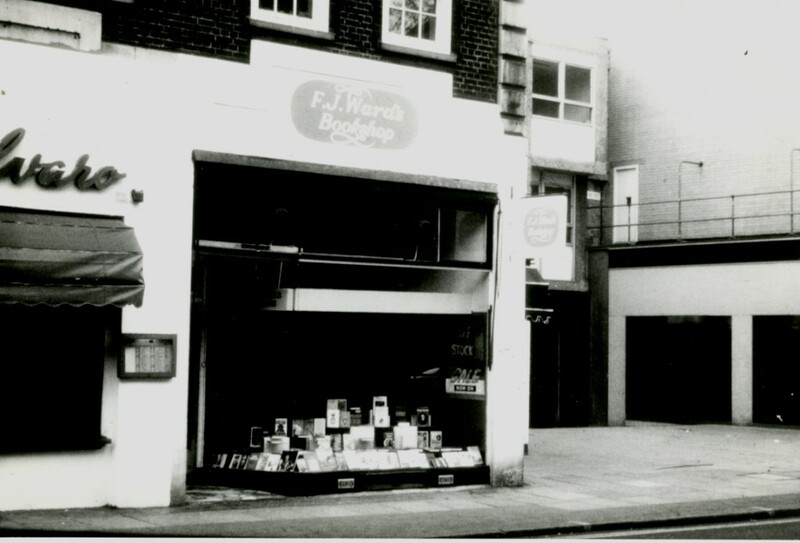 This was the first section of the new premises. On the left you can see a temporary bridge over Ball Street. This is the east side of King Street showing a Derry and Toms building and a door to the old fire station. 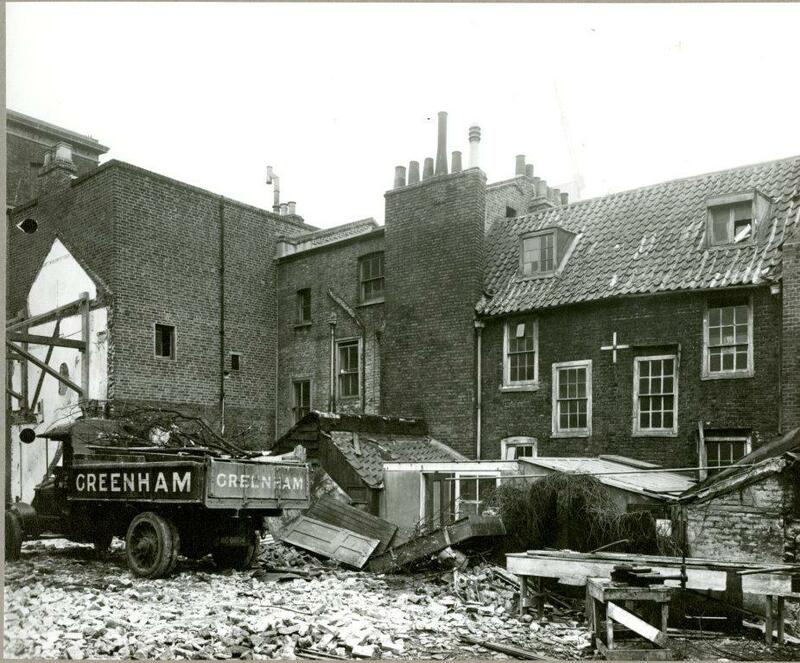 The hoarding on the left shows the location of Ball Street. 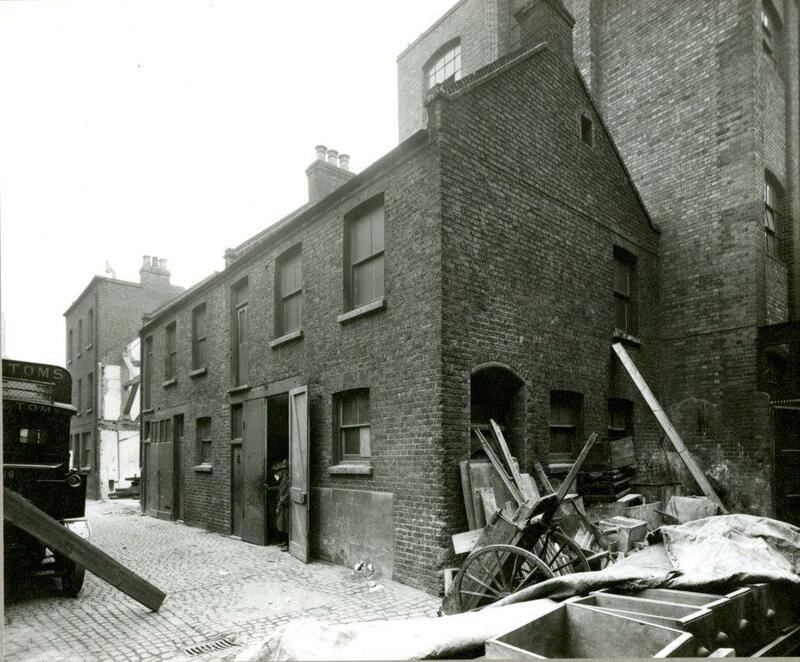 This is a view of the rear of the west side of King Street with part of Burden Mews (look back at the plan). 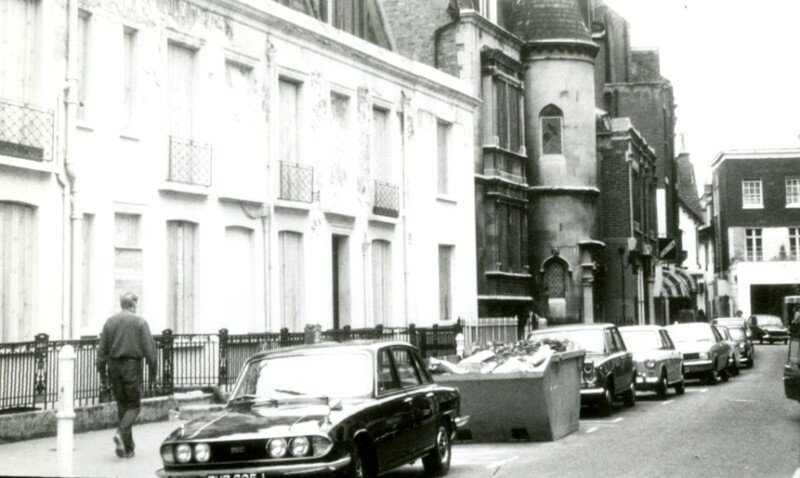 I’ve included this picture of the corner of Burden Mews purely for the convertible. Motoring experts will soon identify it I’m sure. 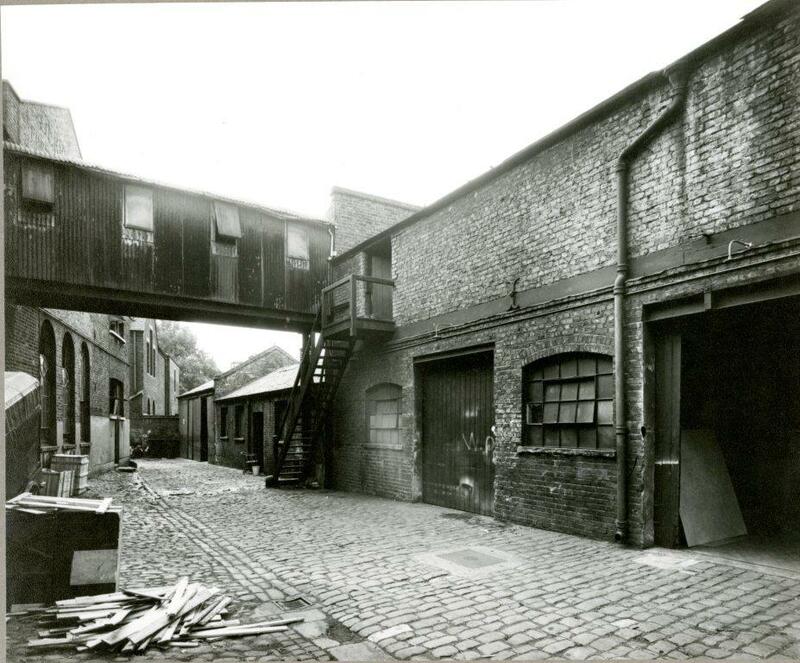 This is Derry’s Yard, a narrow mews on the west side of Derry and Toms well out of the public eye, with a rough bridge connecting two buildings. More demolition in Burden Mews with a couple of figures in the background exchanging a few words about the work in progress. Here another group lurk in a doorway perhaps avoiding the camera. Can you spot another solitary figure below? A man in a white coat on the first floor. Back to Ball Street now. 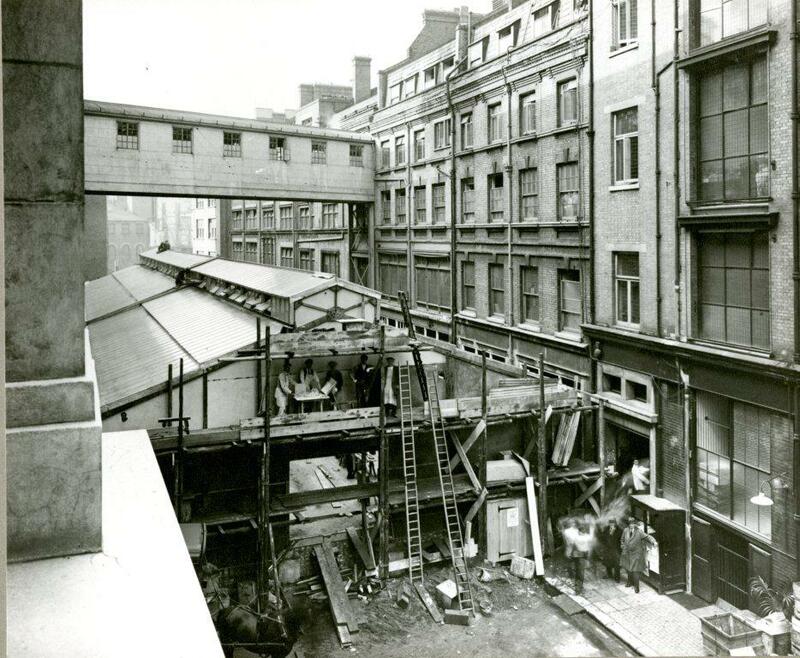 It’s filled with the “covered way”, a temporary structure (man on the roof) and a clearer view of the bridge connecting the old and new buildings. 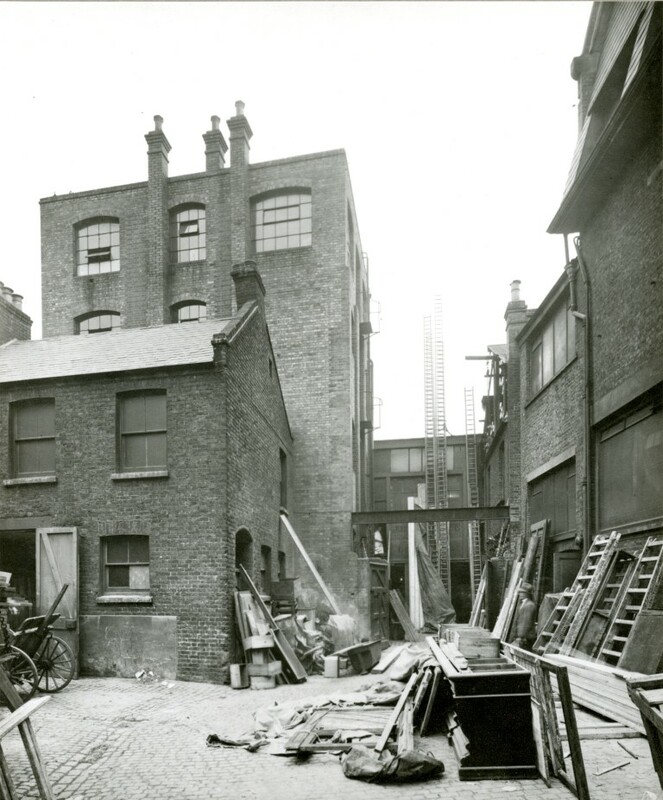 This is the way it looked from the other direction in October 1929. The men on the scaffolding are actually posing for this one. The group on the ground are standing by the temporary staff entrance. Finally, an image from nearly a decade later in July 1938. 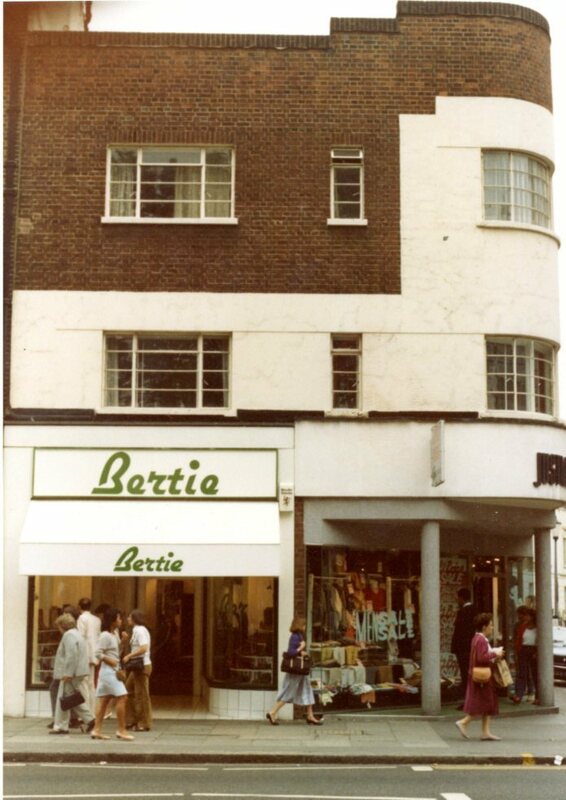 The construction of the Barkers building seems to have been a bit of a struggle but even though the stores that were their original purpose are gone, both it and the Derry and Toms building remain as are 20th century classics which have in their way influenced the whole of Kensington High Street. I wanted something to break up a flurry of posts about book illustration so the Trevor Bowen Estate came to the rescue again.